Huxley was right you know. When the box arrived I was 10 years old again. 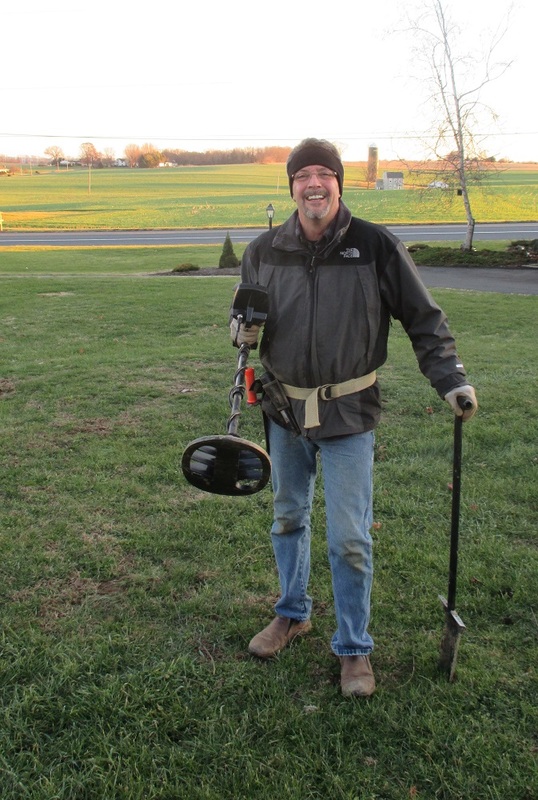 A brand new metal detector. For a while, I had been toying with the idea of this new toy. By the end of November, I had the chosen the model I thought best and pulled the trigger. Picking antiques and buying bottles and glass at shows and auctions had become old hat for me. None of that compared to pure discovery itself. I wasn’t being challenged. My enthusiasm was on the wane and I was losing steam. I realized I’m more in love with the finding than the find. Like the sixteen years I spent fossil diving, I needed to dive back into discovery and uncover what no one else has found. I wanted to discover and commit to memory that piece of history seen for the first time with my own eyes. Who doesn’t look on with absolute fascination at a news event about a time capsule reveal? Those time capsule stories have always been a stop-me-mid-step-with-my-plate-in-hand-on-my-way-to-the-kitchen, to stare with childlike wonder at what’s discovered. 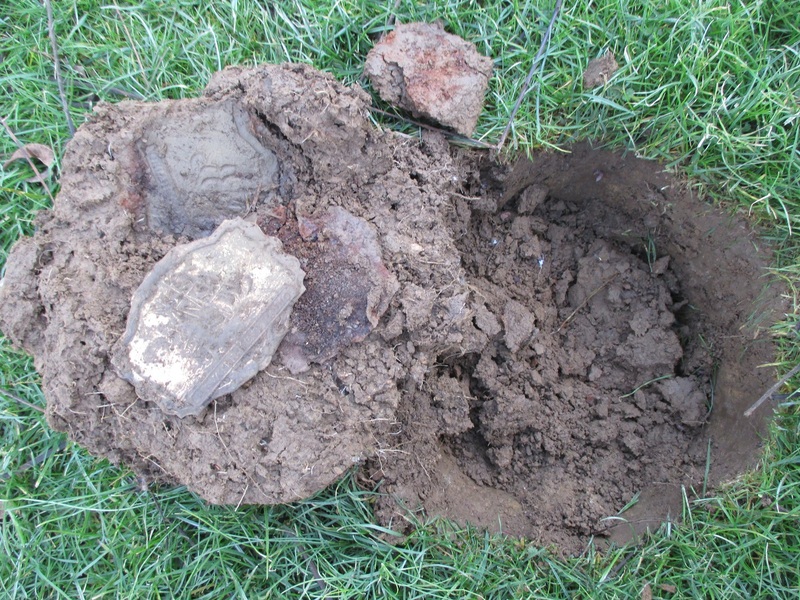 The ground beneath our feet is the ultimate time capsule. The magic of the past is always right there. Every dropped or lost artifact and coin patiently awaits, its little tail wagging. 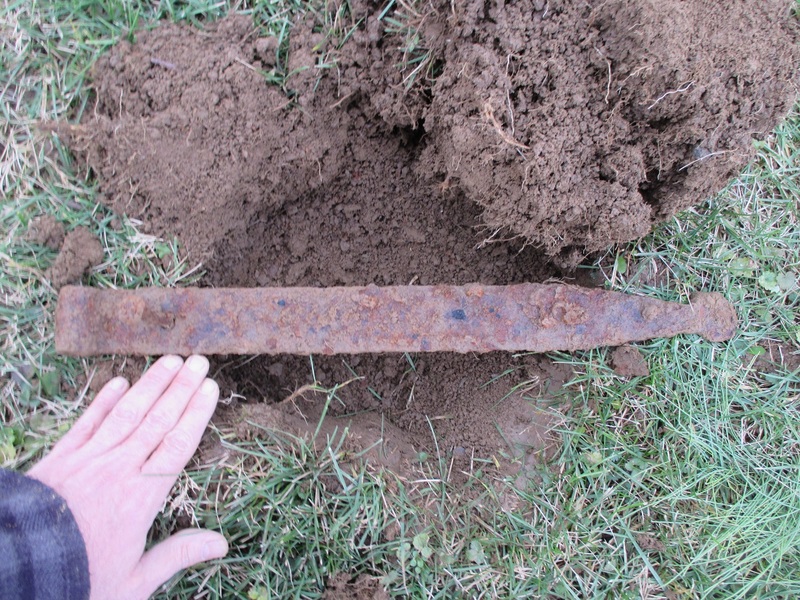 You never really know what’s under there, but with a metal detector you will. It definitely brought back the spirit of this child. Every signal is a potential little archaeological dig. 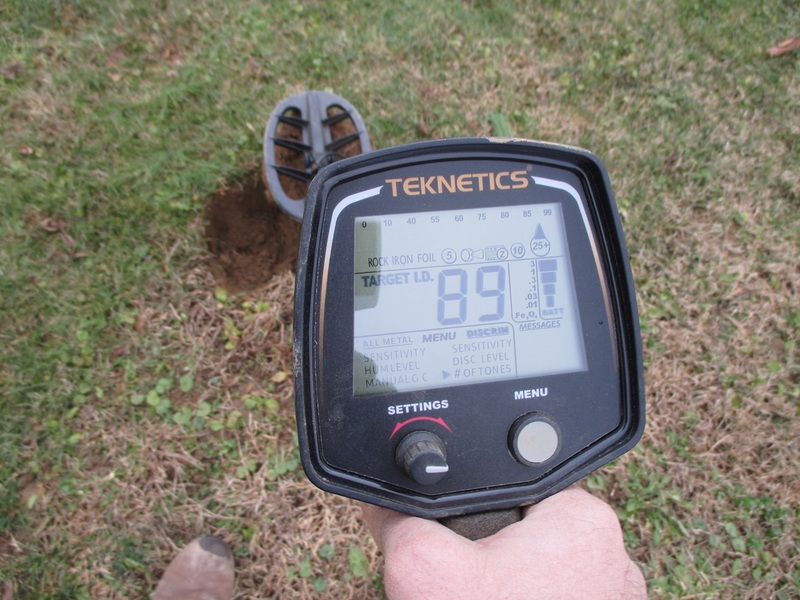 Settings can be adjusted to discriminate out iron and other objects/alloys to make underground discovery of historical items quite easy and rewarding. 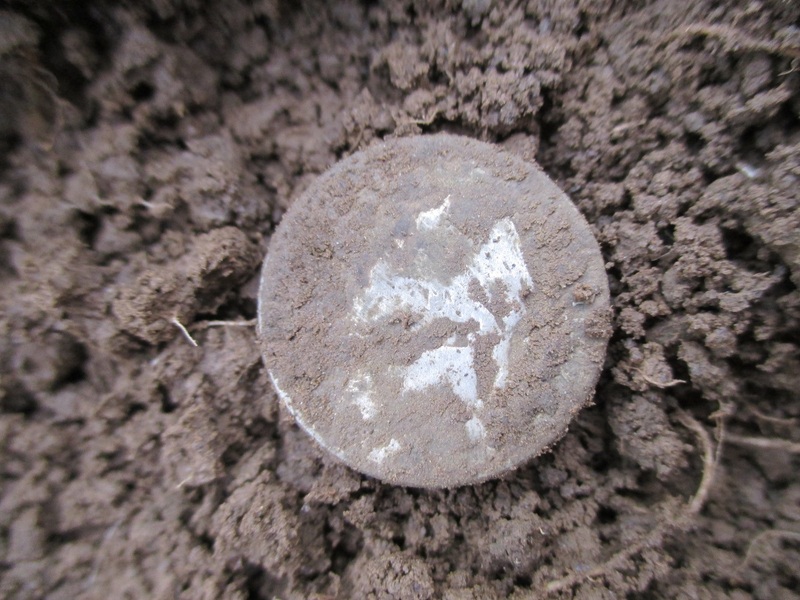 The most amazing thing I’ve found about metal detecting is not that you’ll know the identity of every item you find in the ground, it’s the pure and simple fact that alot of the time you won’t. Then comes the fun, the finding out, the learning. Research and patience challenge my simple mind and get my tiny fists pumped. There is no greater thing than new knowledge. This new toy proves there’s no better tool for me to acquire it. And yes, there could be gold coins too. The signal sound was the one I wanted to hear. The icon arrow readout was hitting the quarter symbol, and the 89 reading told me something good was here. I cut the spot, popped the plug, then used the detector to see if the item was in the hole or in the plug. The detector indicated it was in the plug. 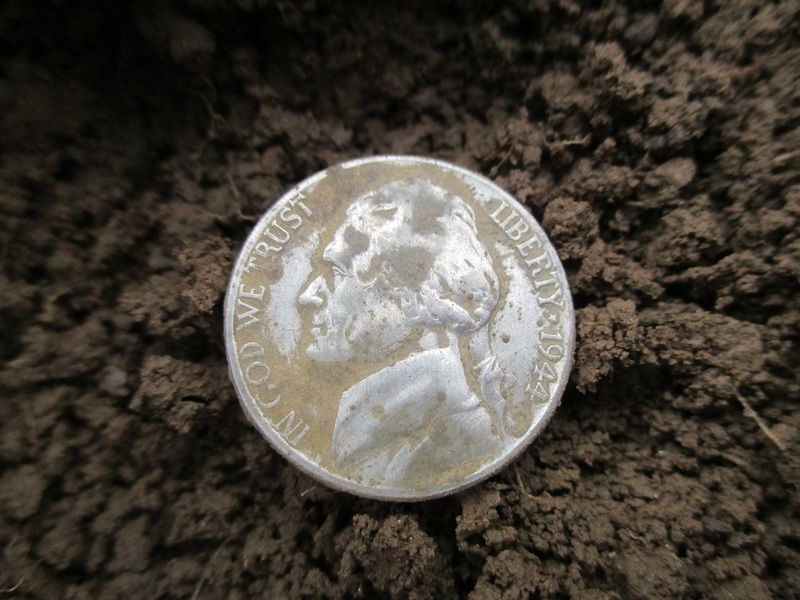 It turned out to be a Roosevelt dime, reading strong as it was shallow. I got 65’d. 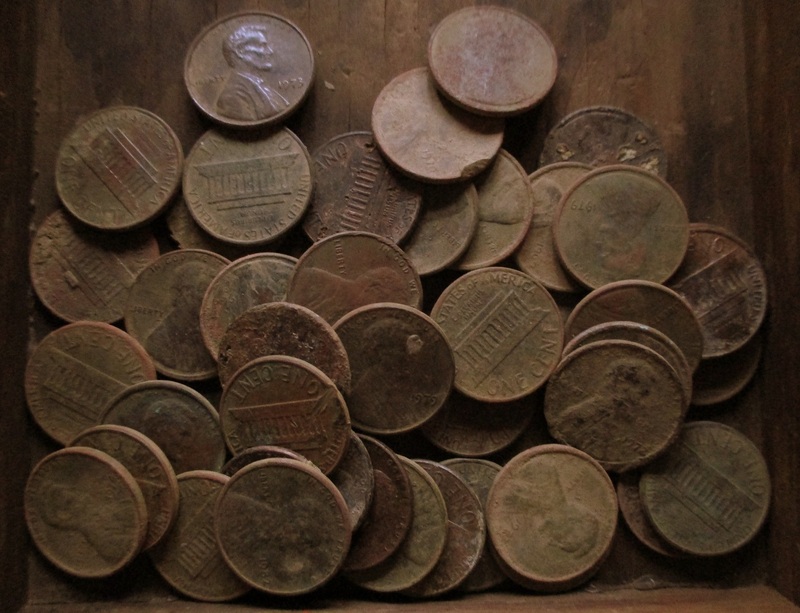 Getting 65’d is detecting lingo; that was the first year dimes and quarters were not made from silver. 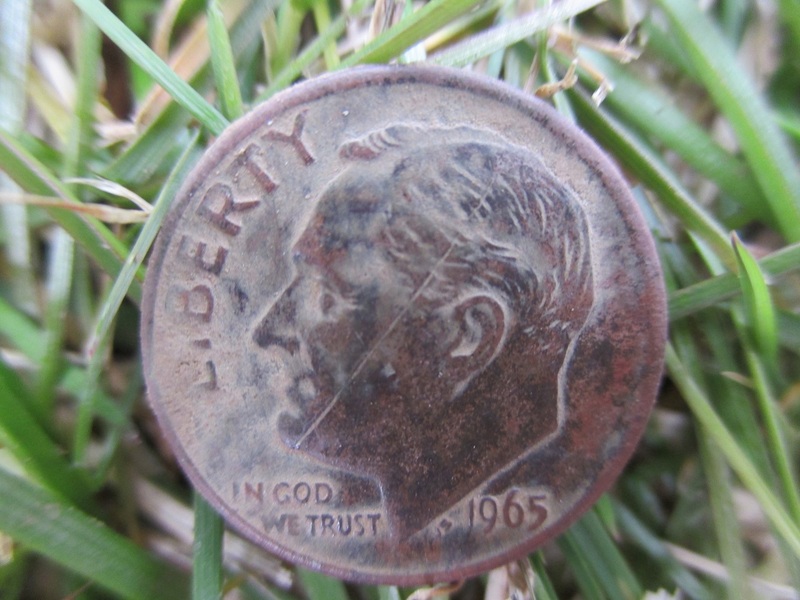 It would have been a much better, shinier find if this dime was a 1964. That’s the key end date for silver. Having been born in 1965, I can feel better as it’s my key date. It took a learning curve to get used to the detector, but since I’ve never lost that childlike wonder for exploring and discovery, color me a very fast learner. So far, I have only used it on the property where I live, a rural, late 18th Century farmstead. (There’s 43 acres left here, no mule, and I’m still not done yet.) Out in the yard on December 4th found me under a large tree where I chanced upon a 41 cent pocket spill from the late 1980’s just a couple of inches down. Probably a young couple making out. I wish they had more money. A comically ironic situation. I spent a hefty sum of money for the detector and accessory tools, only to find 41 cents. (Not even a decent tip for a cup of coffee.) 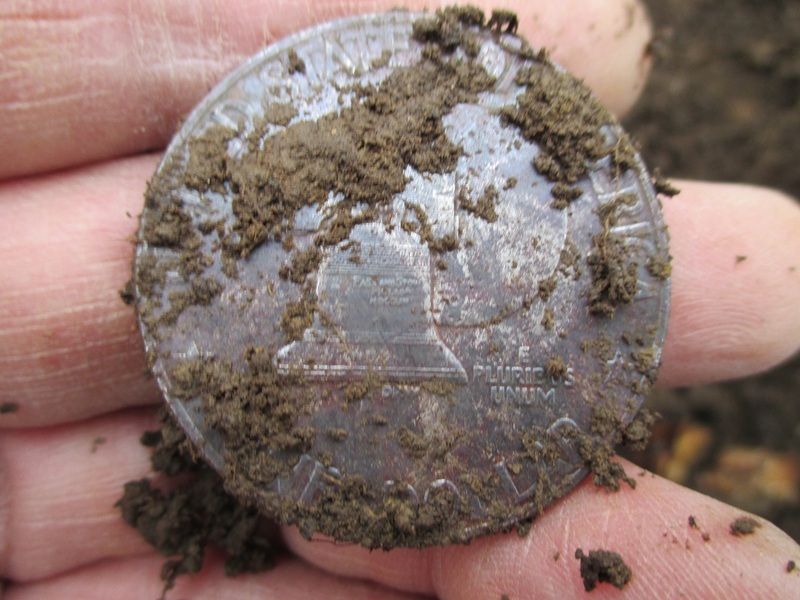 I do like the patina of these coins from being in the ground almost 30 years. 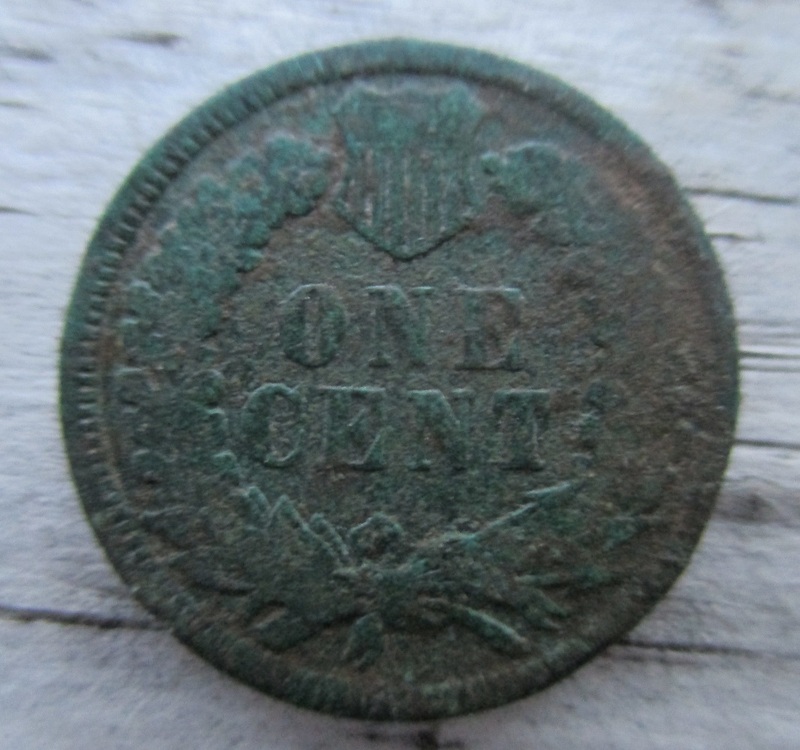 My very first find of 41 cents was from a time relatively recent, but I’m keeping in mind history began yesterday, and winds its way back from there. I would evolve with the machine and get very good at finding the ‘old ground,’ where the older, more interesting items were waiting. I first learned that under large old trees, still standing or not, folks once sat (and did other things) and items spilled from their pockets. I still had no idea that first day just what amazing finds awaited me. Knowing winter was coming, I would spend weekends and the last hour of daylight left after work, fine tuning my abilities with the detector. It paid off in dividends of discovery, wonder, and fun, as you will see. 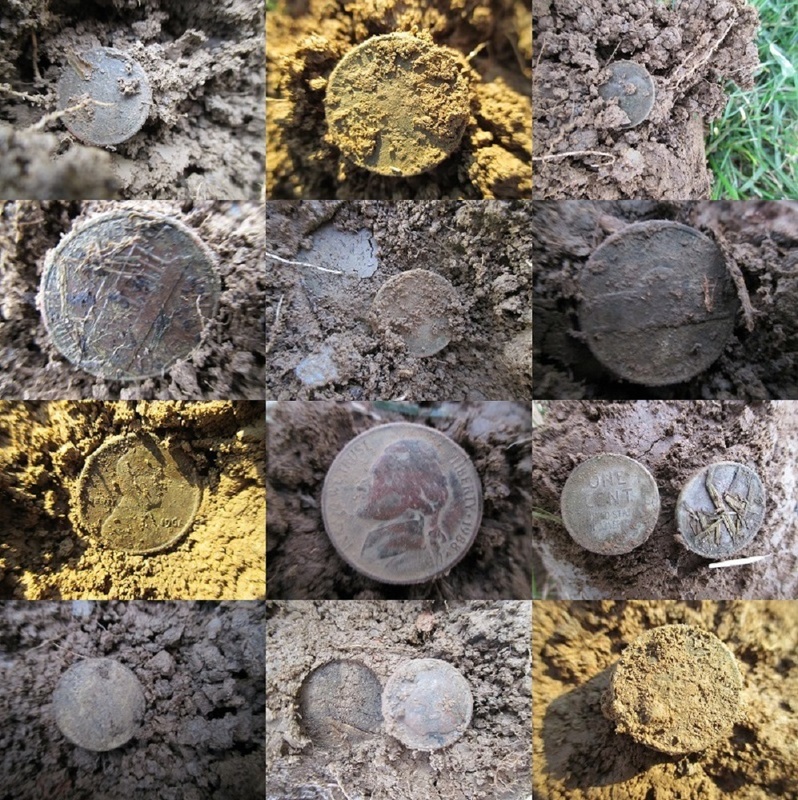 Collage of 20th Century coin finds. Including pennies, I’ve found over 100 coins and I’m sure I haven’t found all on the property yet. On December 7th, I found myself in the backyard. I was swinging the detector along like being led by an excitable dog on a leash. 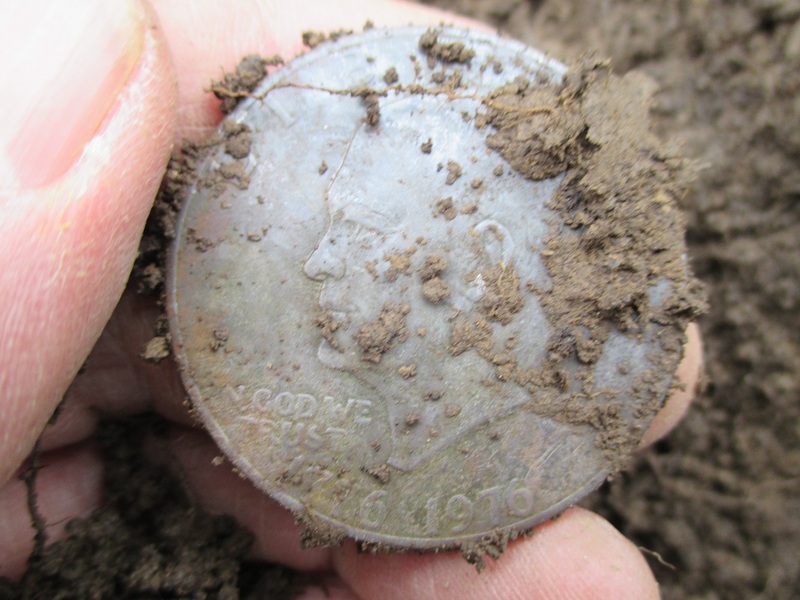 I had already found a couple of 1940’s wheat pennies and then I got a very nice signal, found it’s center, cut a plug and flipped it back to find something very unexpected. 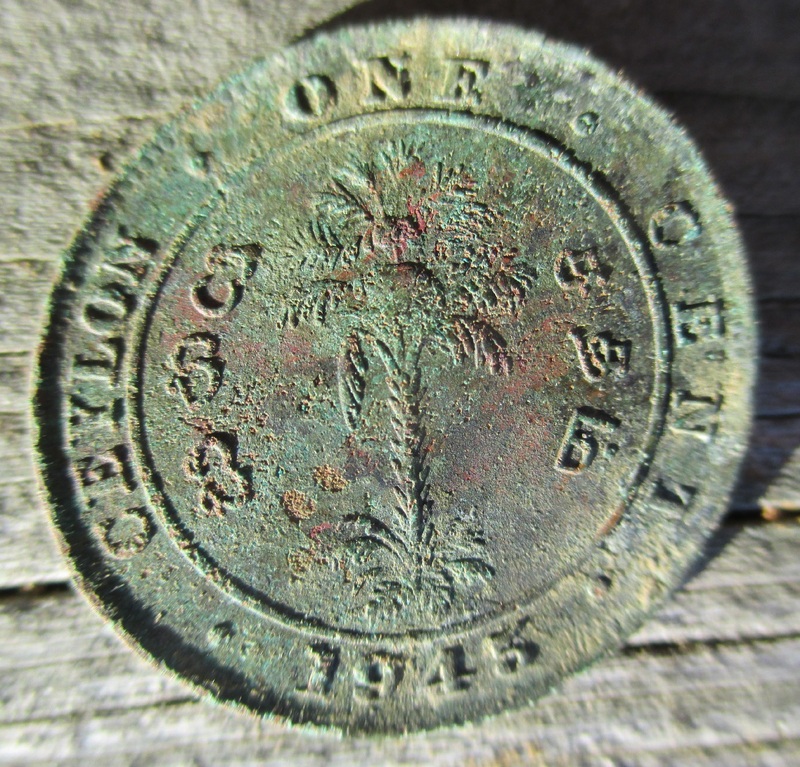 A bent 1945 King George VI bronze one cent from India. I was born with a Linus brain too. The large old button was in the backyard, the thimble in the front. The thimble is not signed, but the button is: BROWNING KING & CO NEW YORK. 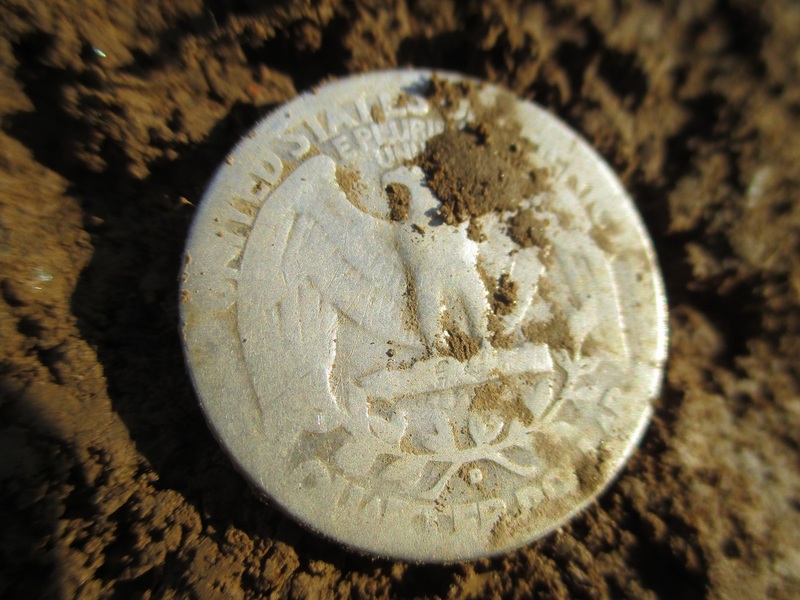 After thirty seconds of research, I found that this button was made between 1860 and 1934. Behold the power of both Google, and an awesome website only about buttons. A nice find. Buttons in themselves are very collectible. There’s no fortune here however, it’s just a cool old button. 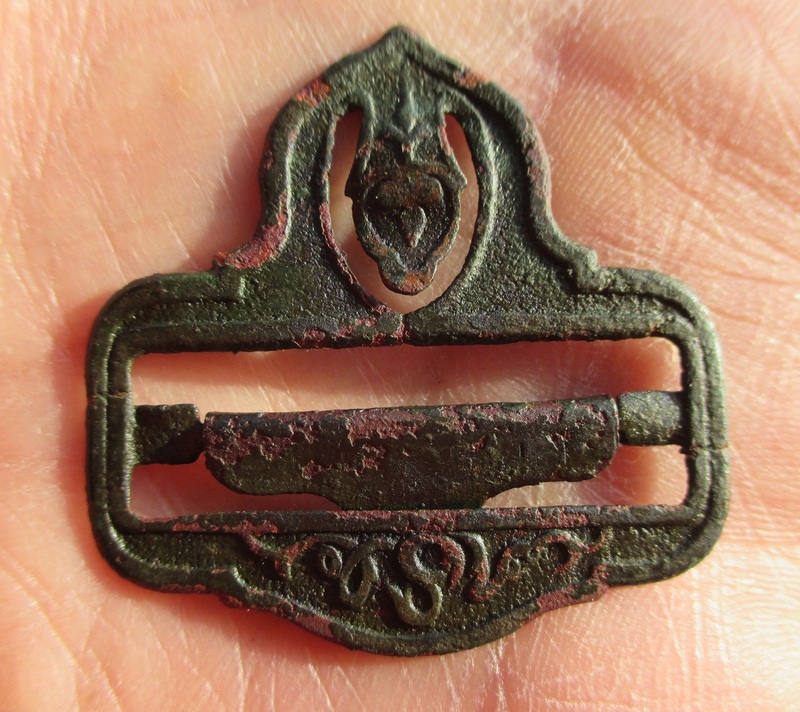 This late 1800’s suspender buckle was a nice surprise. 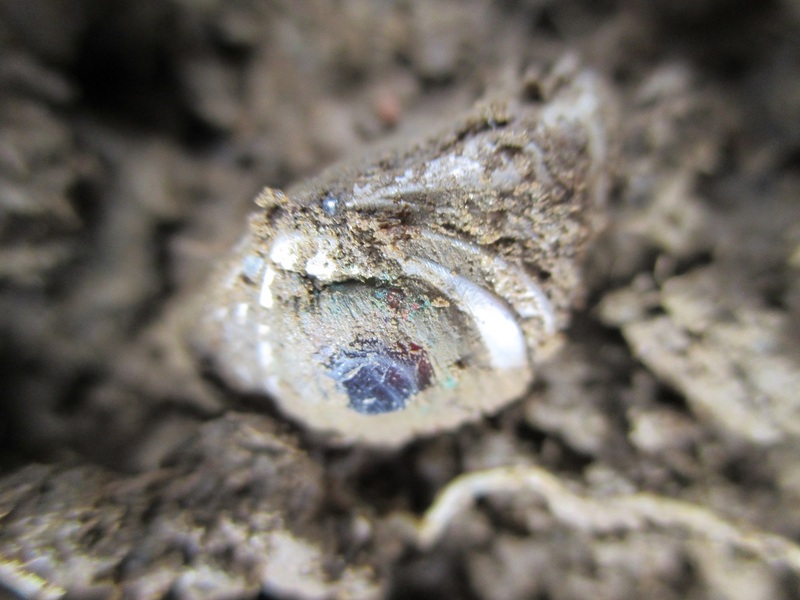 In the photo above, it’s fresh from the hole and seeing sunlight for the first time in over 100 years. It’s so delicate, yet all the moving parts still work and it’s not even bent. I found a very mangled, near identical one with a Patent date of 1888 on it. This one is not dated, but is no doubt the same era. I was detecting near the well, which is actually not far from the front porch. 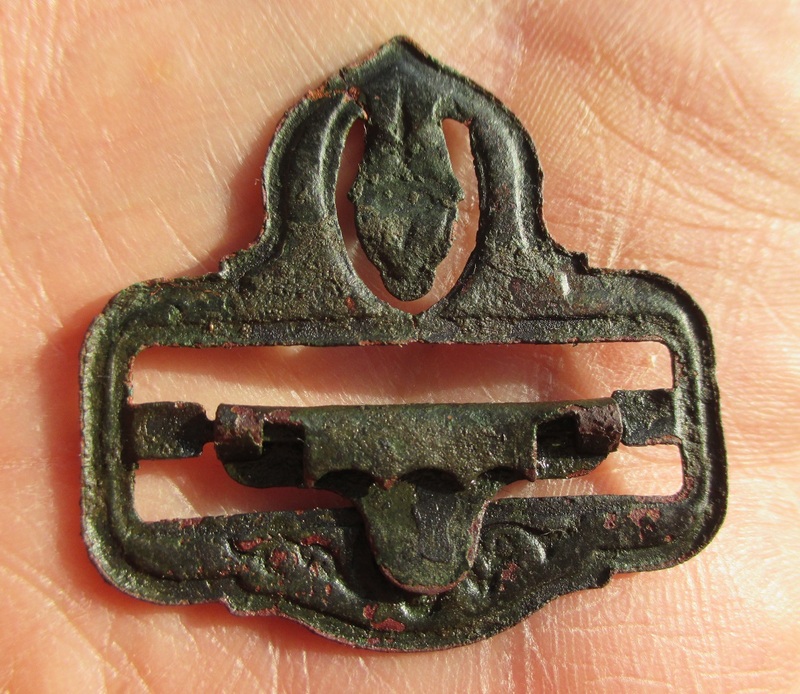 Looks like some old timer had suspender issues long ago, but this buckle didn’t. I’m amazed at how well it held up, after all this time in the ground. 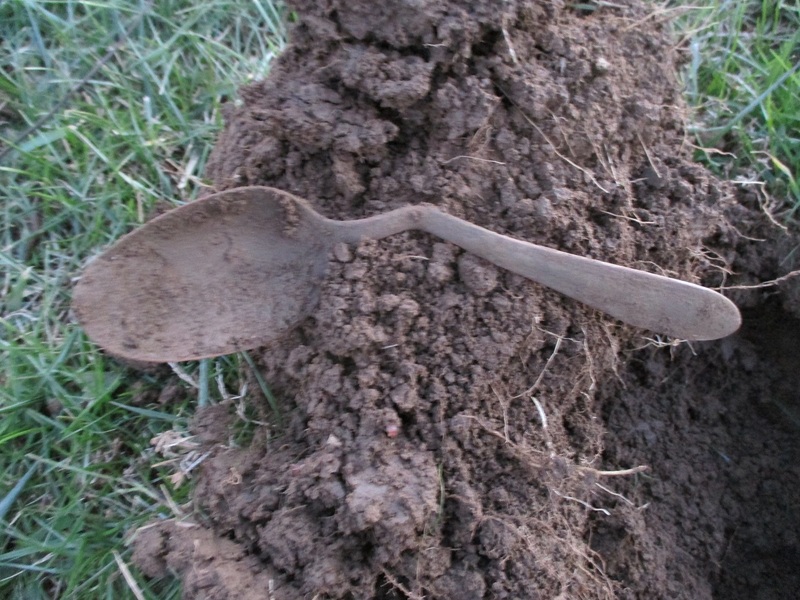 I learned very quickly there’s quite a variety of items in the ground, and dining utensils proved no exception. I like the artsy bent angle of this old silverplated tablespoon. 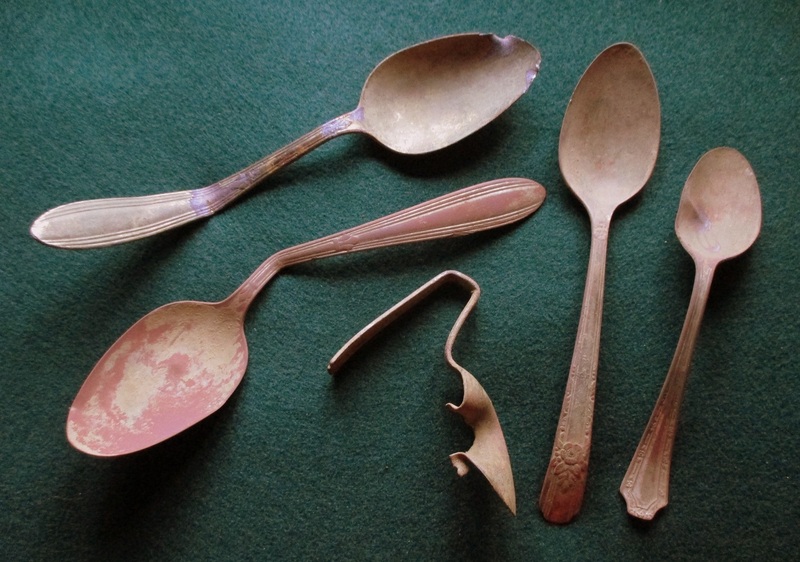 I did find a handful more, although curiously enough, no forks or knives. One spoon I found was shot. I found 5 spoons representing 4 different patterns. One was execution style, the remaining four were natural causes. But When Can I Have the Keys? Now. Here, have these. 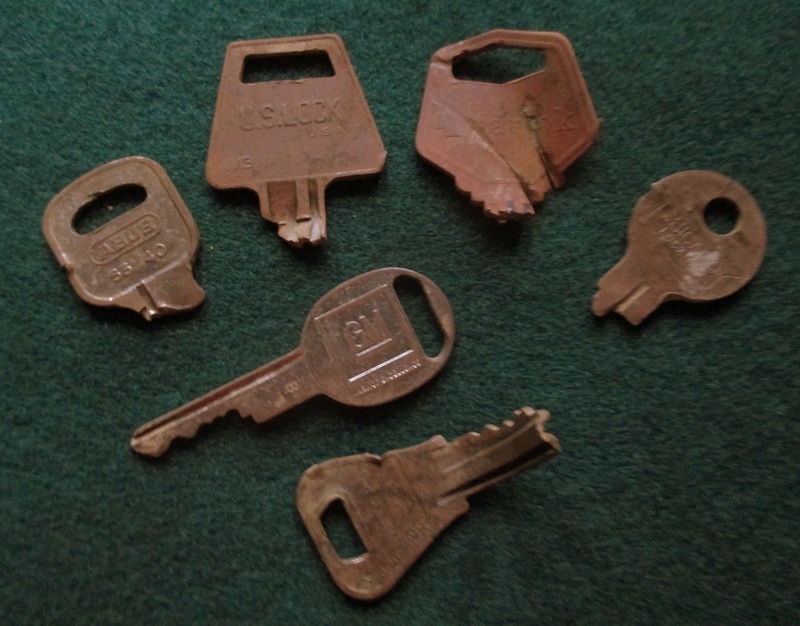 Just don’t ask for a cool old skeleton key any time soon. You can have all these first. Don’t mind the broken ones either. And no, I don’t know how that one got bent straight up that way. Yes, likely a lawnmower. The General Motors key makes me wonder where that car is right now. 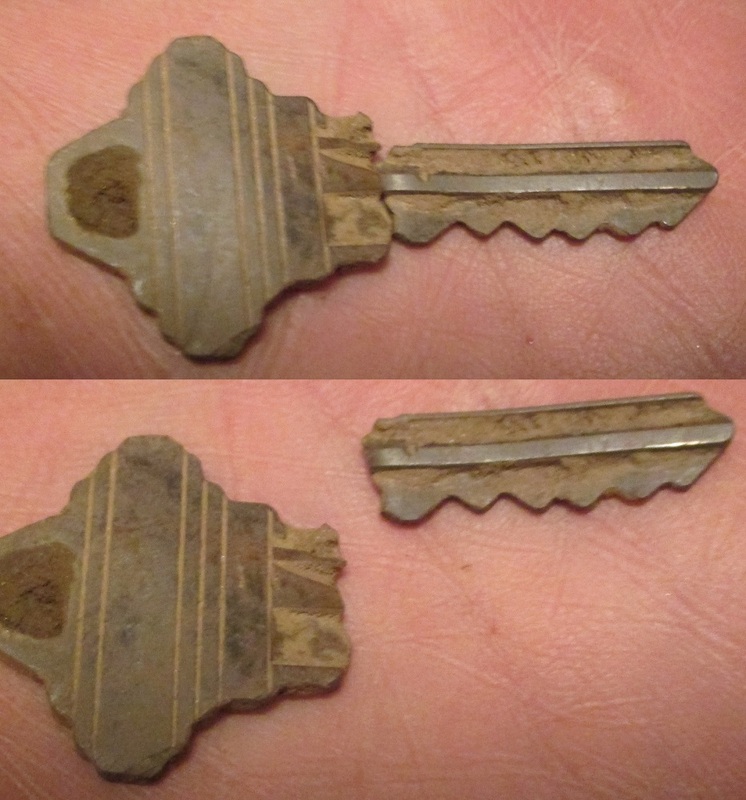 This key below was very fun to find, I had found the shank in the northwest yard near the cornfield. About an hour later, I was closer to the barn, where there are apartments. I found the handle nearer to the barn. There’s definitely a story here, and I can only guess at what kind of drunken, frustrated, relationship fight this was at the door. It likely happened back in the 1980’s to match the $.41 found under the tree near there. That was the night they met. The handle went a good throw, but the shank, later pulled with pliers, was thrown much further. That was the night they broke up. Every relationship has its ups and downs. I’m a mental defective metal detective. I found this and spent three minutes thinking it was a door handle. Then my neighbor came over to see what I had. 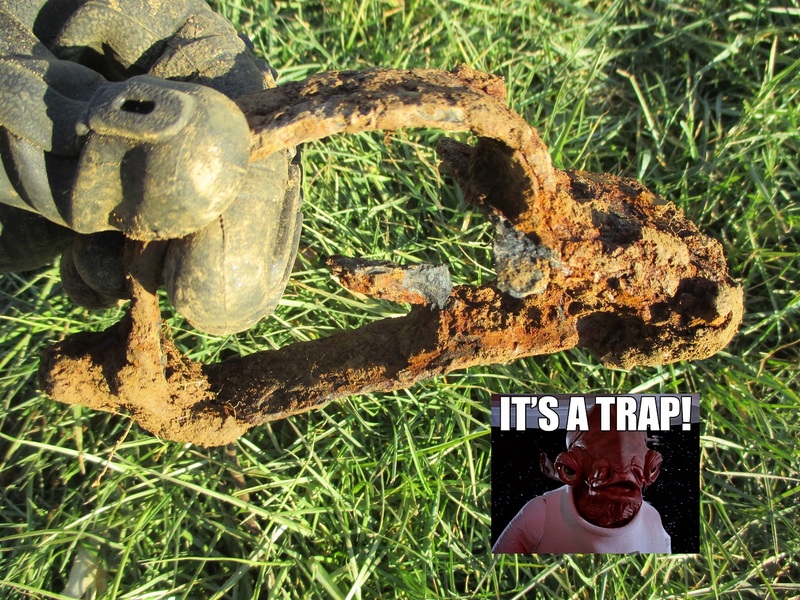 “Cool little trap,” he says. “Yeah, I thought so too,” I replied. An insertion of Akbar from ‘Return of the Jedi.’ Some jokes just write themselves. Living on an old farmstead made equestrian finds inevitable. 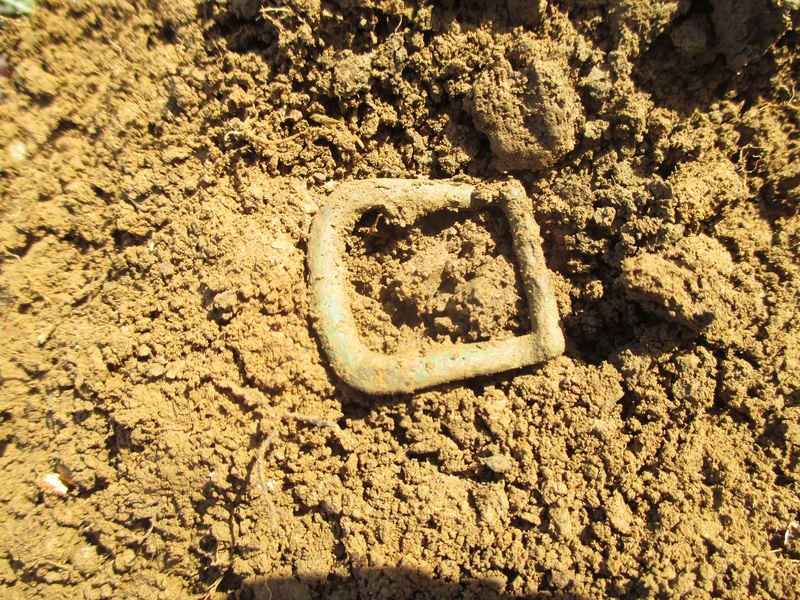 It started with an old brass bridle buckle. 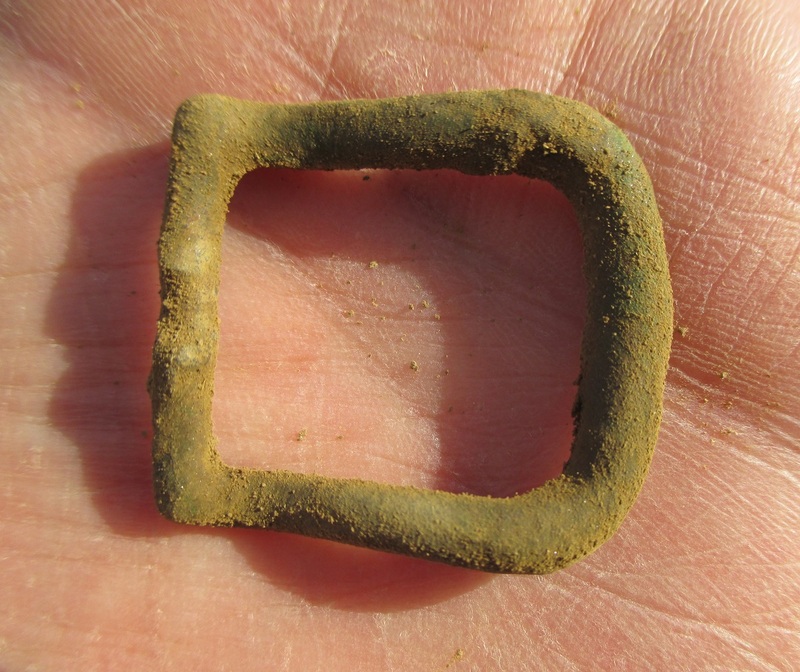 Then I found a bridle bit ring and a worn out broken horseshoe. 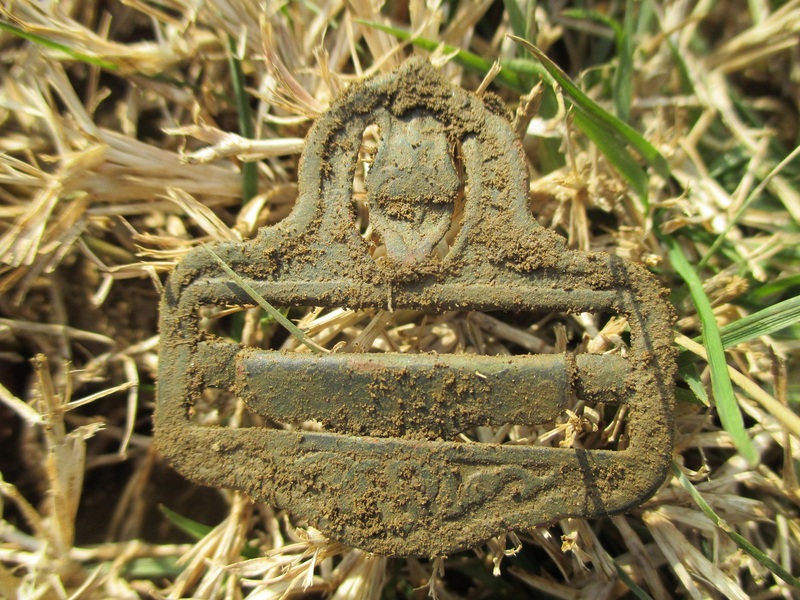 This brass bridle buckle has not seen the sun in over 100 years. Bonus points: say ‘brass bridle buckle’ three times fast. 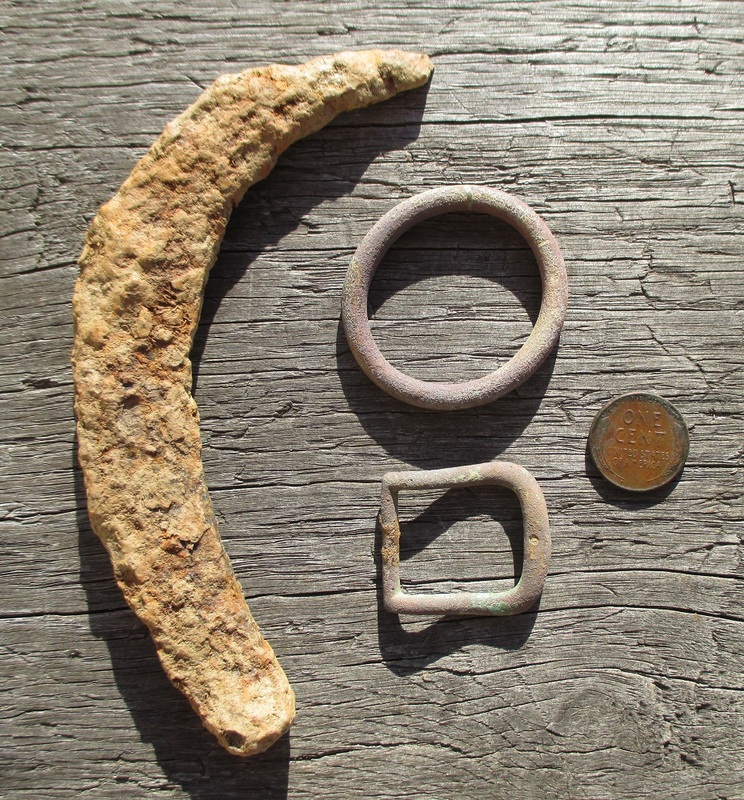 Equestrian finds thus far. 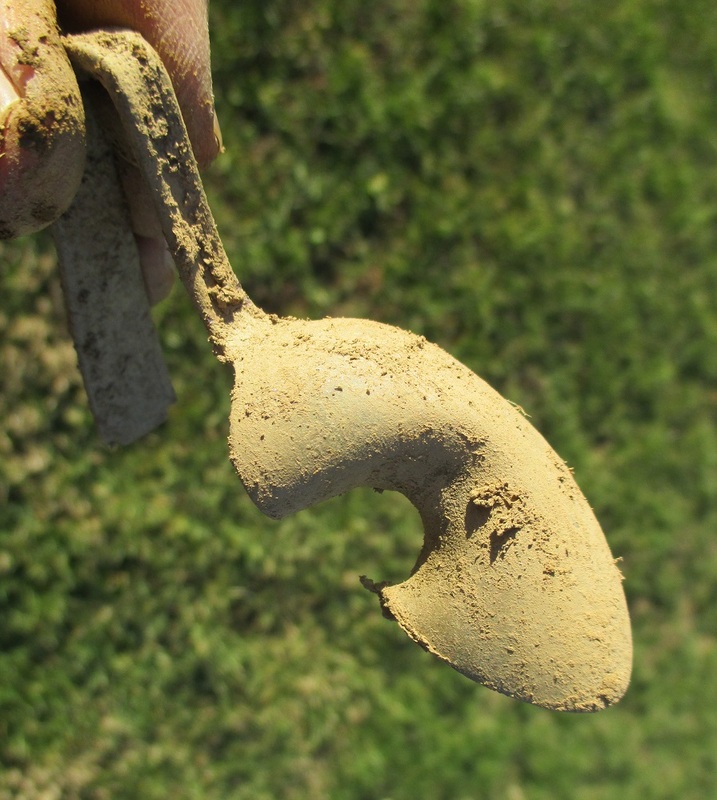 Half a horseshoe worn out to broken; it was deep at about 8″ down. 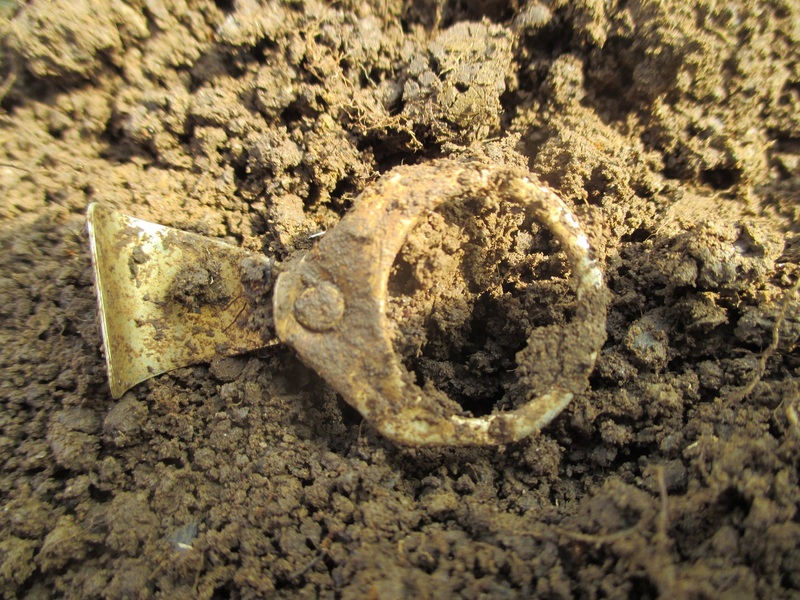 A brass bridle bit ring that was originally made more round than it is now. It’s possible a very strong horse wore this and stretched it oblong. I hope they were careful handfeeding him apples. Note the connecting part at the top. These items date anywhere from the mid 1800’s to the 1900’s. I had gotten a very strong 92-93 coin signal where a tree had been cut down and large dead roots were over the target. I knew digging this wouldn’t be easy and grabbed a hatchet to cut my way down to the target. (I would never do this to a live tree.) As it turned out, I was able make a another hole from the other side and find my way under to the target without cutting any roots. 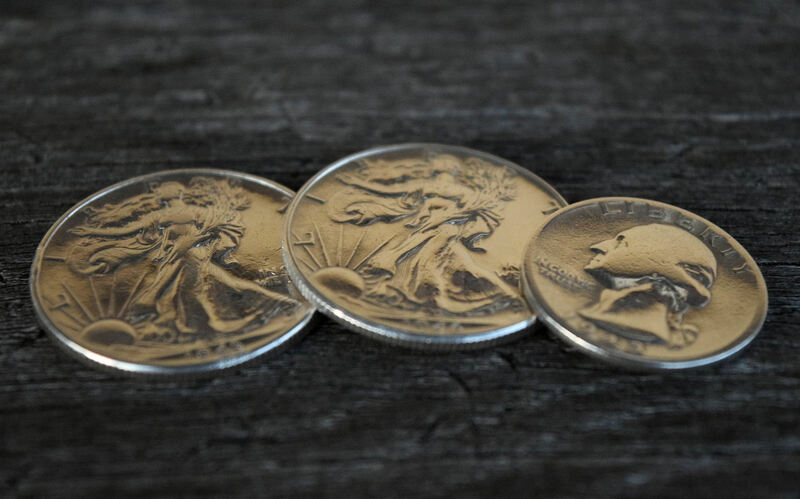 I had secret dreams of an 1800’s Morgan silver dollar laying in wait, as on a very old farmstead this would seem logical, but again, remember that history began yesterday. (And my luck just isn’t that good.) I was still surprised by what was actually there. I remembered these from back when I was ten, and couldn’t recall seeing one again until now. How cool that something under these roots took me back to mine. My handheld pin pointer led me right to this coin. The pin pointer is a very ingenious device; it’s a mini hand held detector. Getting the tip within inches of a target will cause it to sound off and vibrate, more so as it gets closer. It even has an LED light for those times the sun sets with absolutely no consideration that I’m still digging. 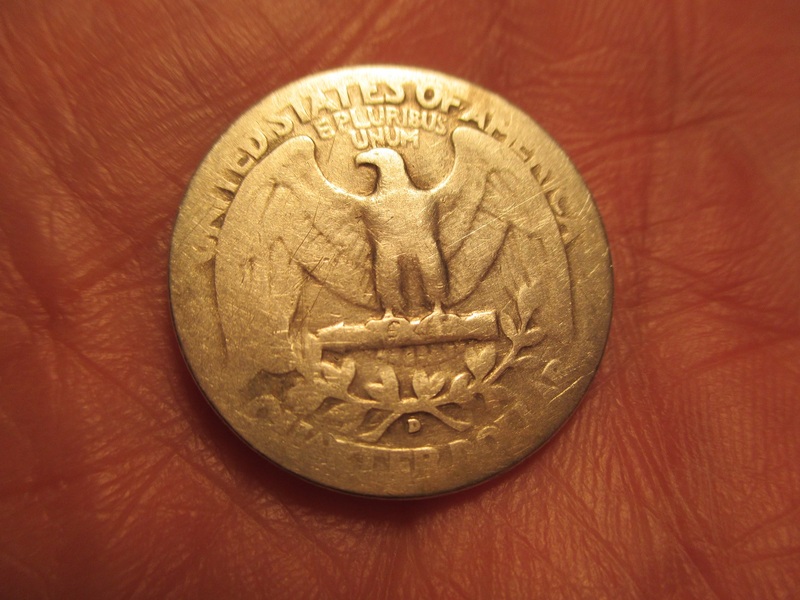 A large Bi-Centennial Eisenhower dollar. I wonder if it was lost in 1976. I also wonder why someone didn’t do a better design on this coin, there’s too much flat space and the profile of a balding Eisenhower looks like my 9th grade english teacher. And why isn’t the moon, (M-O-O-N, that spells moon, laws yes) on a Kennedy coin where you’d think it belongs? Though keep in mind, this was the seventies. This is one dollar I’m not going to spend. I had these as a kid and you never see them anymore. 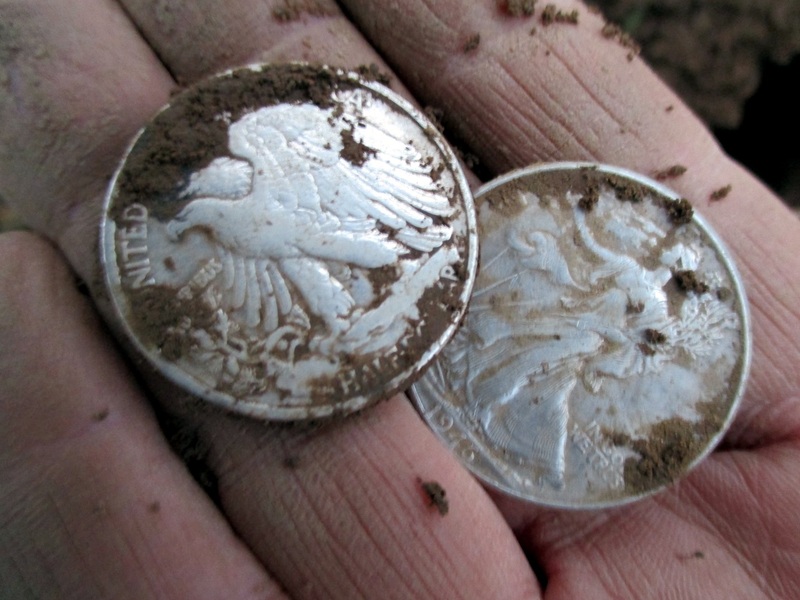 What may be out of circulation to most is not to metal detecting folks. All the non silver clad coinage I’ve found thus far. There’s a whopping $3.80 here. 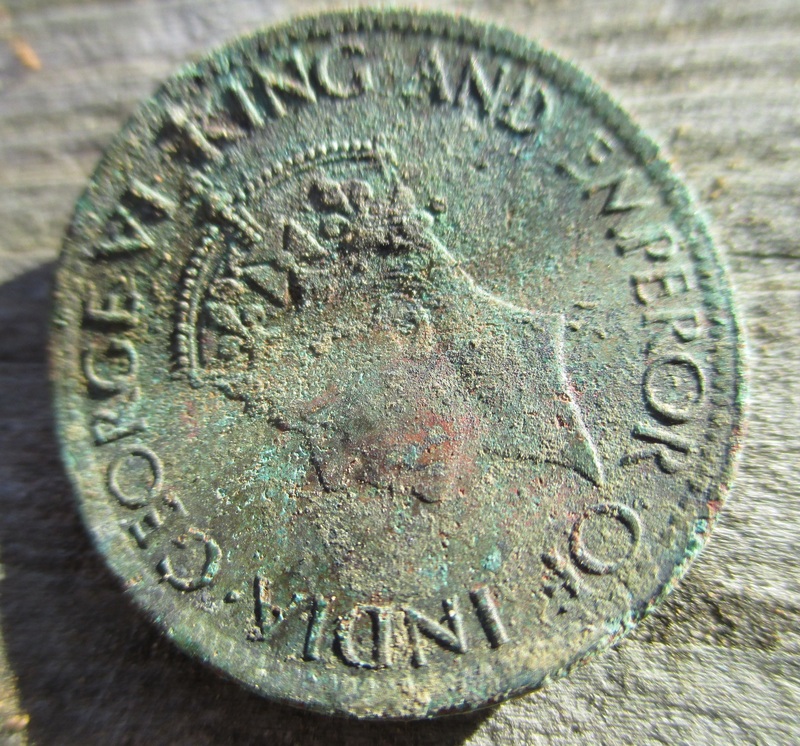 I like the interesting patina the coins take on from being in the ground. 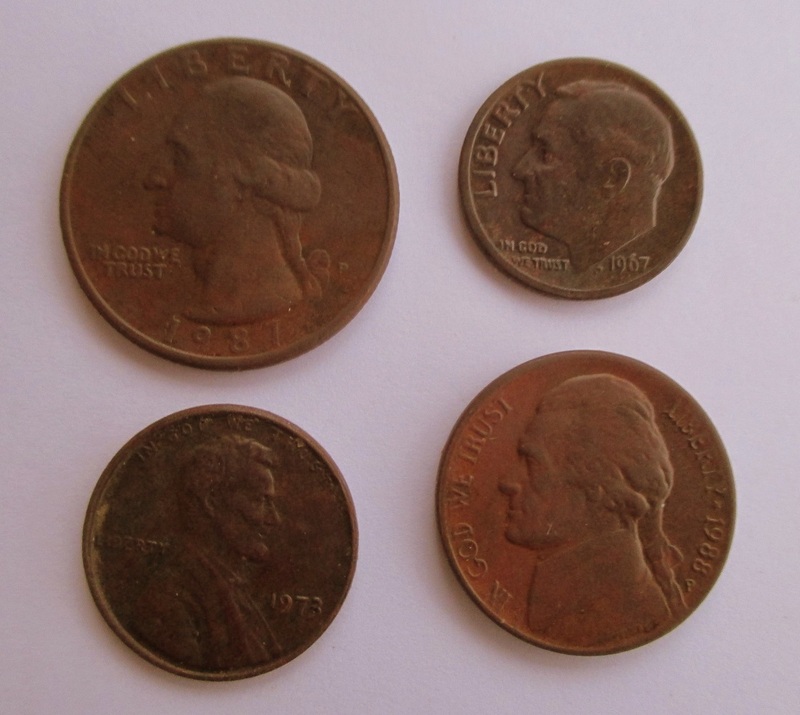 The oldest one is 1965, the newest is the 2004 quarter at the top. 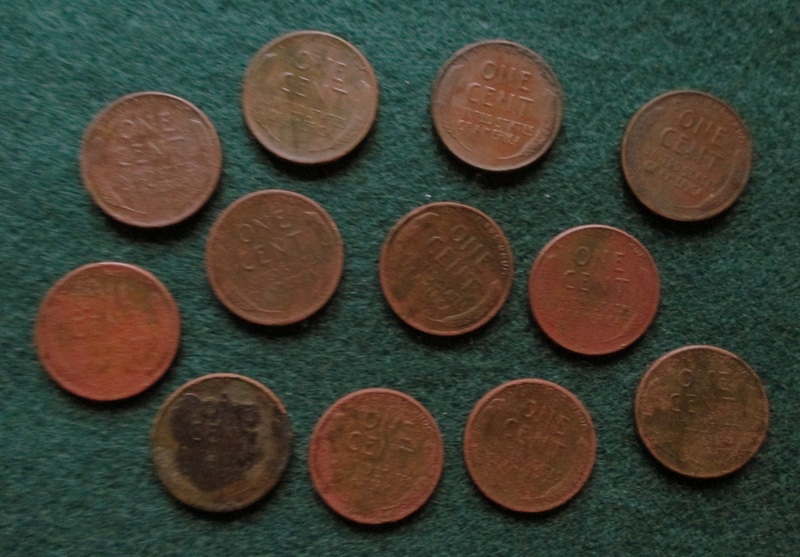 A dozen wheat pennies thus far, and still more to be had no doubt. The oldest is the funky black stained one, lower left, 1926. The rest date from 1940 to 1957. 1959 was the key date pennies changed from wheat to the Lincoln Monument. I haven’t even counted these, just dropped them into a box. There’ll be more to add. 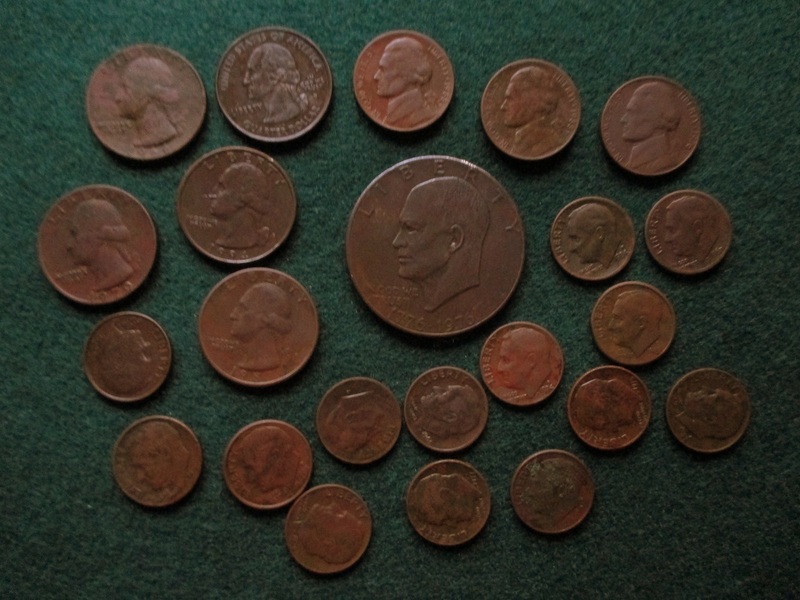 Even if just pennies, there’s nothing like a hobby that makes money pile up. Item: An early 19th century hand forged bevelled strap hinge measuring 20″. 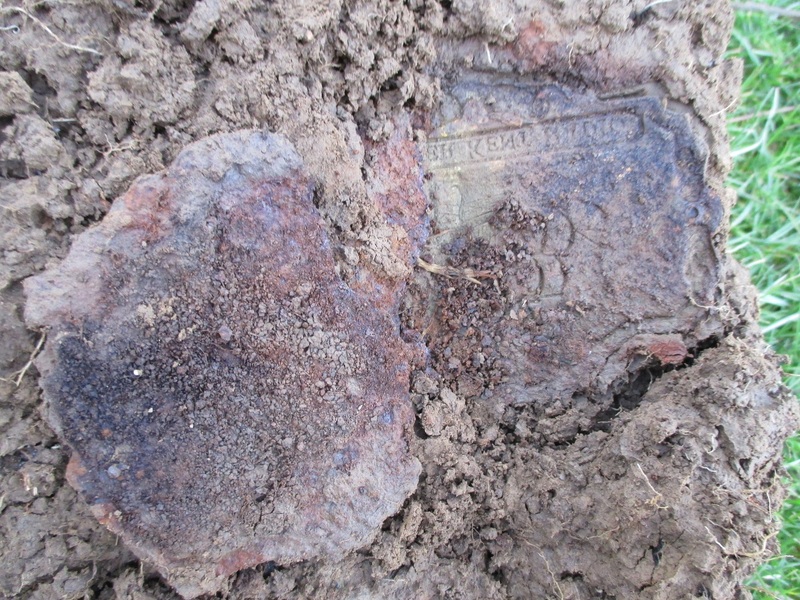 Location: Just west of the farmhouse, but not entirely past the barn, about 6″ deep. Historical Context: It was on the barn door a long time ago. Notes of Interest: When I first dug down and saw the center of it, I thought it was a sword. What in God’s Name Will You Do With it Now: I have absolutely no idea. Important Disclaimer: I should note here that I have found hundreds of objects and artifacts, many I chose to omit here due to length. 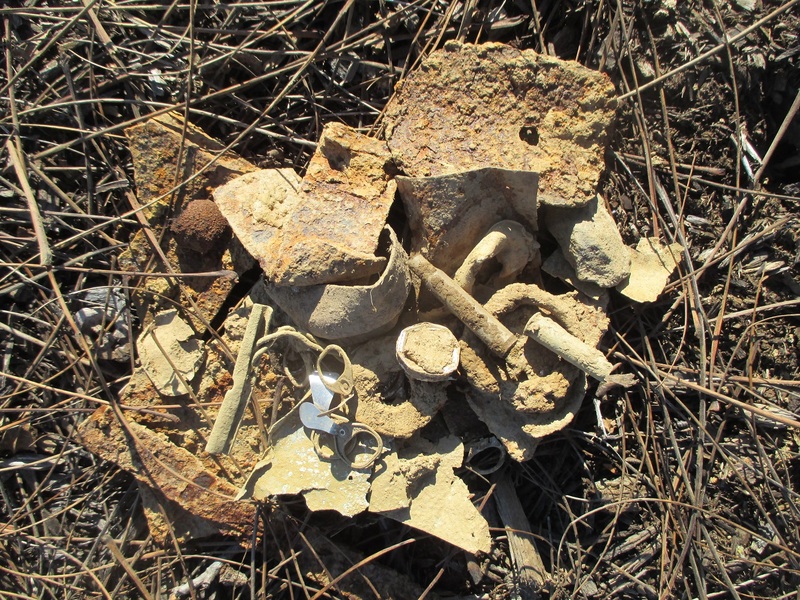 My finds also included a large amount of trash items. I certainly won’t bog the reader down with a photo of ground trash, but will focus on the more interesting and important finds. 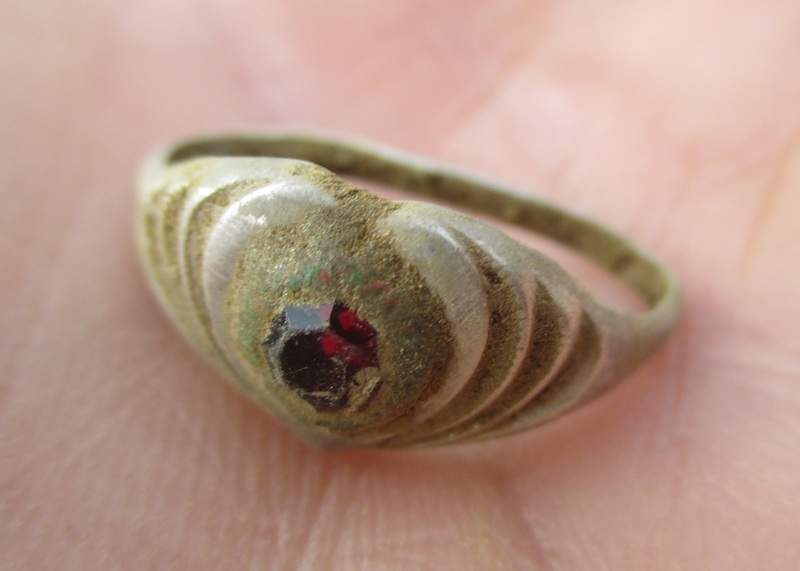 This is to show you the reality of metal detecting. The ground may be full of history, but much of it is absolute trash. This pile is one of many I made at the base of a tree before gathering up and discarding. The scrappy metal wasn’t too bad, as it wasn’t as widespread as the dreaded, obnoxious pull tabs. The bullet casings numbered plentiful here at the farmhouse and I learned to know them by their particular reading and began to not waste my time digging them. There’s a saying in metal detecting, “When in doubt, dig.” I keep that saying in mind whenever I’m unsure of what’s under the coil. There is also a spot in the backyard that earned my affectionate nickname: ‘Tinfoil Hill,’ which, after many a hard fought hole and much uncertainty, I managed to survive my siege. “Can slaw” is another fun detector term and it’s a fun encounter, believe me. Picture aluminum cole slaw after a lawnmower has schredded a can to bits, after which those bits have seeped into the ground. 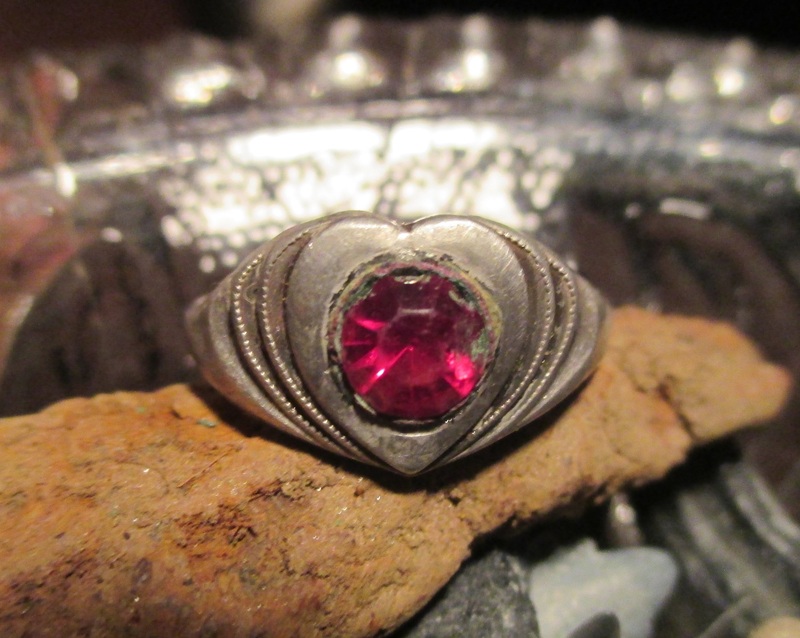 You don’t just pick up a metal detector and find only goodies, you find everything. After digging that everything, you realize the goodies are always earned. There will never be a last one. But to not dig these means the possibility of missing something very good. On December 10th, I decided to get an hour in after work. Home by 3:30, the sun set at five. This was only my fifth time using the detector. I was between the house and the barn going around a large tree that was no longer there. All of a sudden I got a 92 reading which remained screaming and constant, like a baby on a long flight. I didn’t have to be a Newbie to know this was something very good. 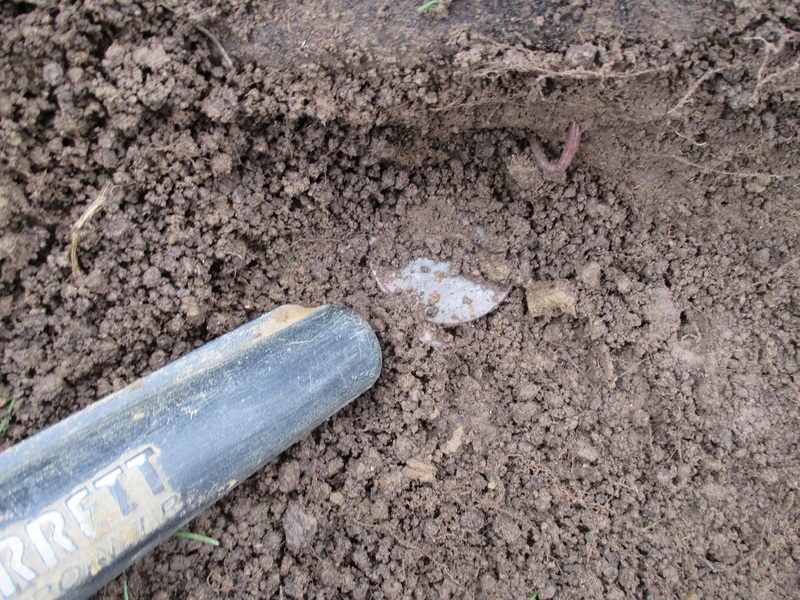 I cut a wide hole as not to damage the target with the cut shovel and flipped the plug. Then I flipped. There wasn’t one target, but two, both clearly visible without the need of the pin pointer. 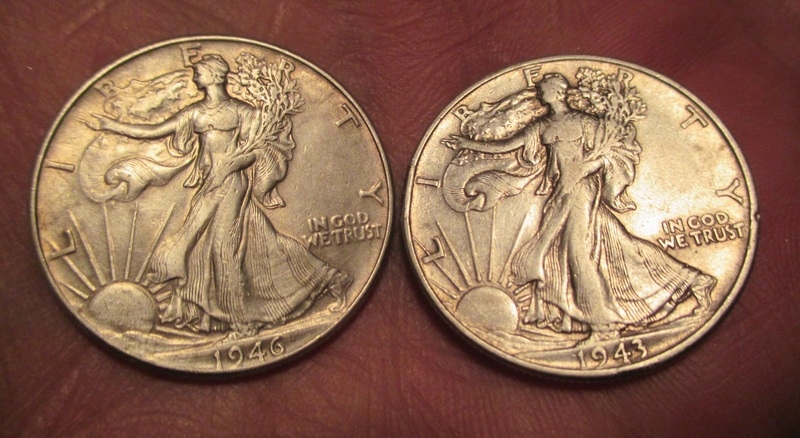 Two beautiful Walking Liberty silver half dollars, one dated 1943, the other, 1946. Both in such very good condition, I doubt this pocket spill under the tree happened any later than 1947. I had flipped the fully exposed one over to see what it was, then restrained myself (somehow) and ran inside for my camera. I was like a cartoon character, my feet didn’t even touch the ground. There’s no such thing as Attention Deficit Dis-Oh look! Something shiny! Having run back with my camera, this was the scene. 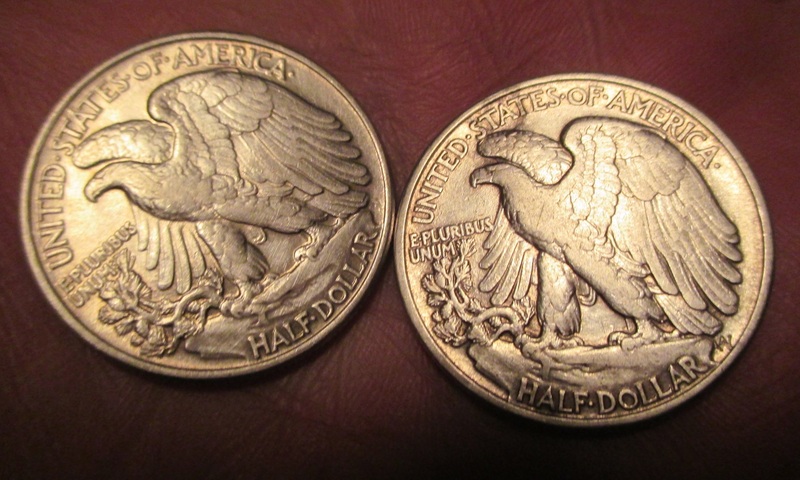 Note the stained imprint to the right of the half dollar I flipped. 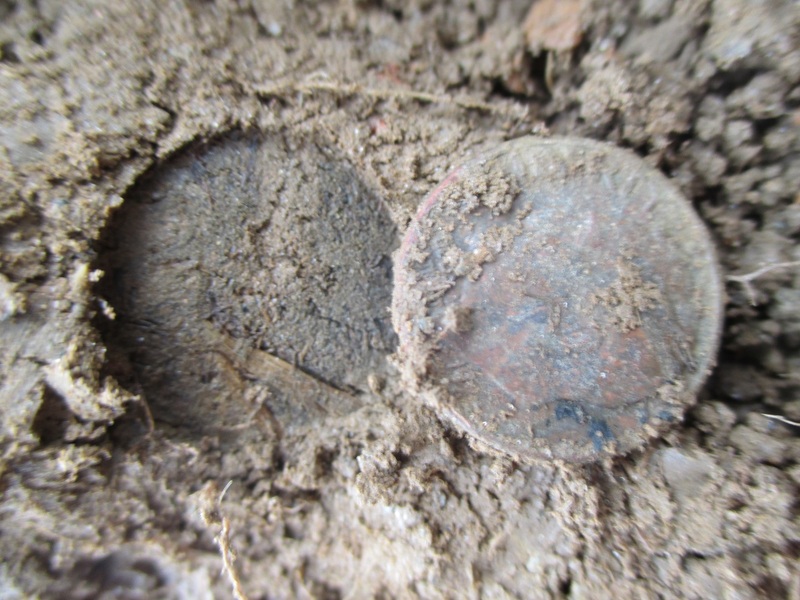 The lower half dollar is still in situ untouched. I had no idea silver could stay so clean in the ground. Walking Ladies in the dirt. My very first silver find. It was like a dream. A gentle rinsing was all these beauties needed. It’s not their monetary value, as these are not rare, but finding these made me realize how much prettier in design our older coins are. Beautiful Ladies and Eagles. An astounding find, two in one hole. One ounce of silver. This is one spot in the yard I won’t forget. And not because I dug the hole too big. Note the upper left where the tree was. 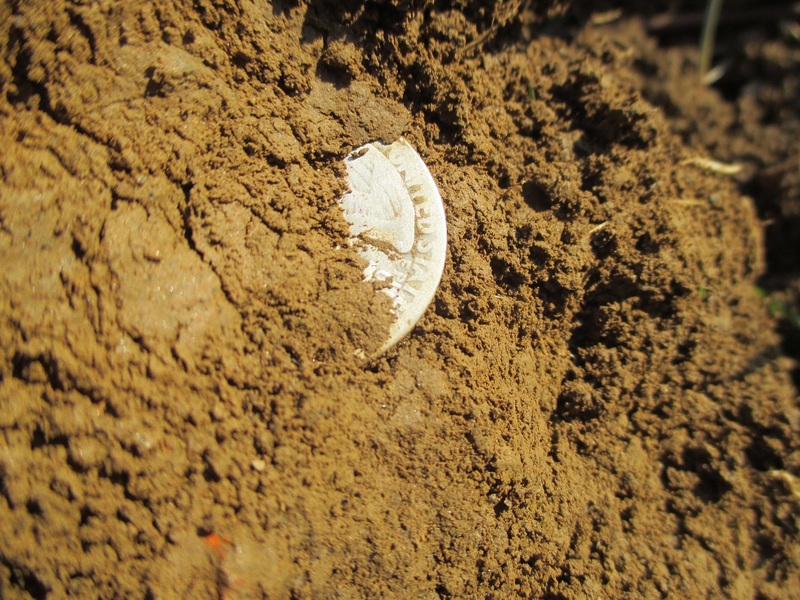 There may not be a coin pocket spill under every large old tree, but your chances are very good to find something interesting. Now when I see a large old tree, I always imagine what could be under it. 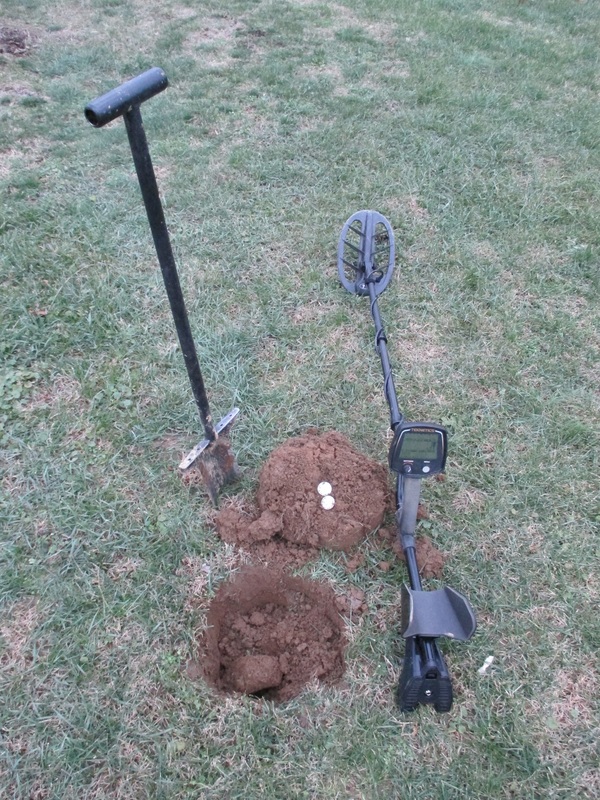 Note to fellow detectors: the incredibly cool cut shovel with the serrated blade is a Raven by Predator tools. Now you will nevermore have to contact me to ask what it is and where you can get one. It’s lightweight and made from very strong aircraft steel. It’s only 40″ high and doubles as a great walking stick. My history seeking journeys around my familiar yard were very exciting and sometimes it would get dark, but I would linger a bit longer. On December 19th, I had gotten a very strong signal as I was going back towards the house. It could’ve waited, but I couldn’t. 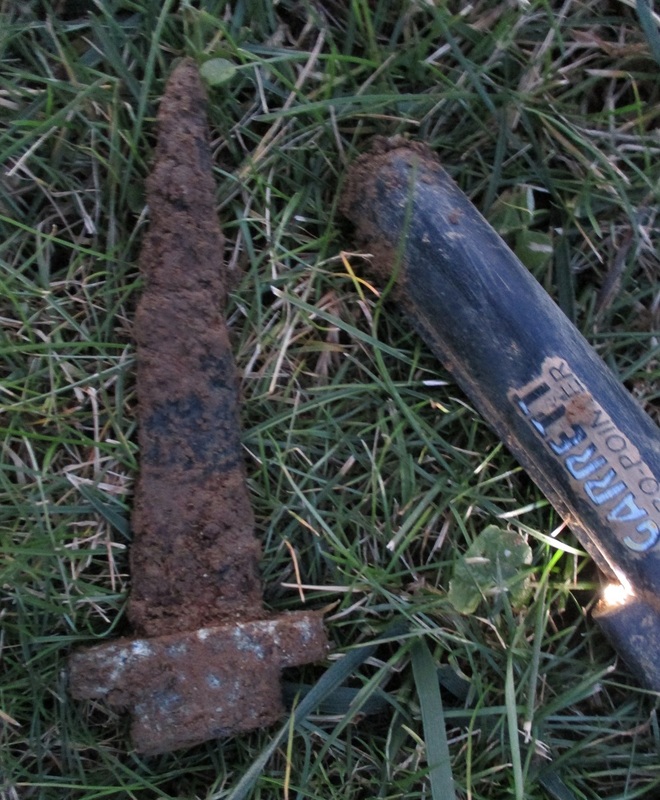 I found what appeared to be a very old iron bladed knife, and what remained of the handle hilt was solid lead. A most interesting knife, I had never seen anything like it. At the time, I had no idea just how old this knife would turn out to be. This was no kitchen knife, this was for hunting and/or butchering. 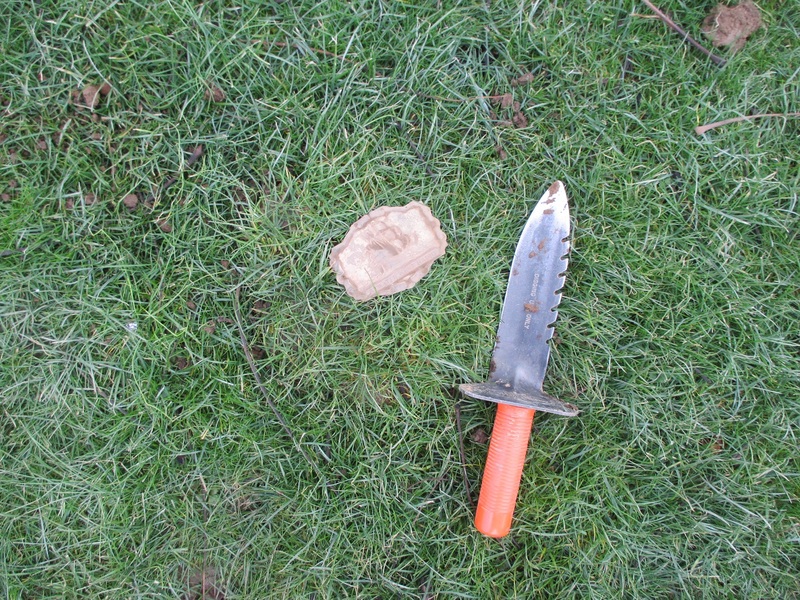 The blade was very well used and resharpened much smaller over time before it became lost to the ground. Before cleaning. 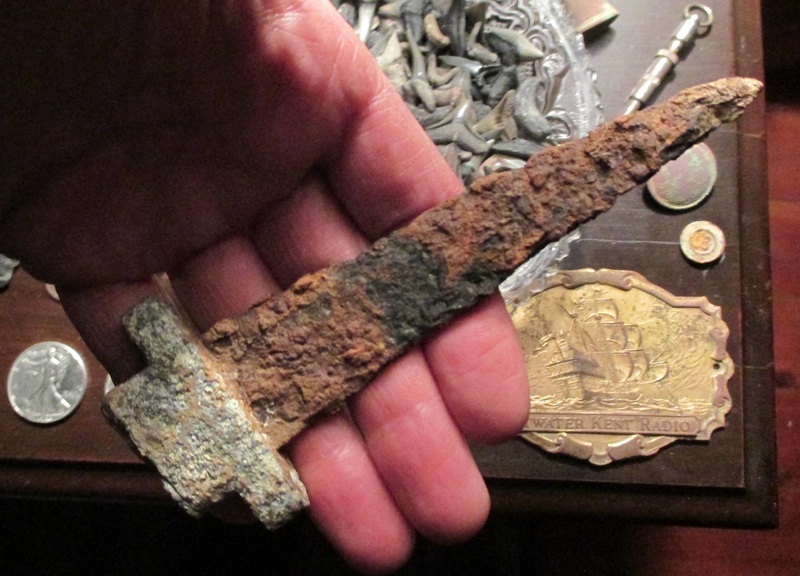 The iron blade was well rusted and the lead hilt , once smooth, is now extremely pitted and corroded. This had been in the ground a very long time. After a very careful cleaning of the blade, this resembles something one would see from the Iron Age. 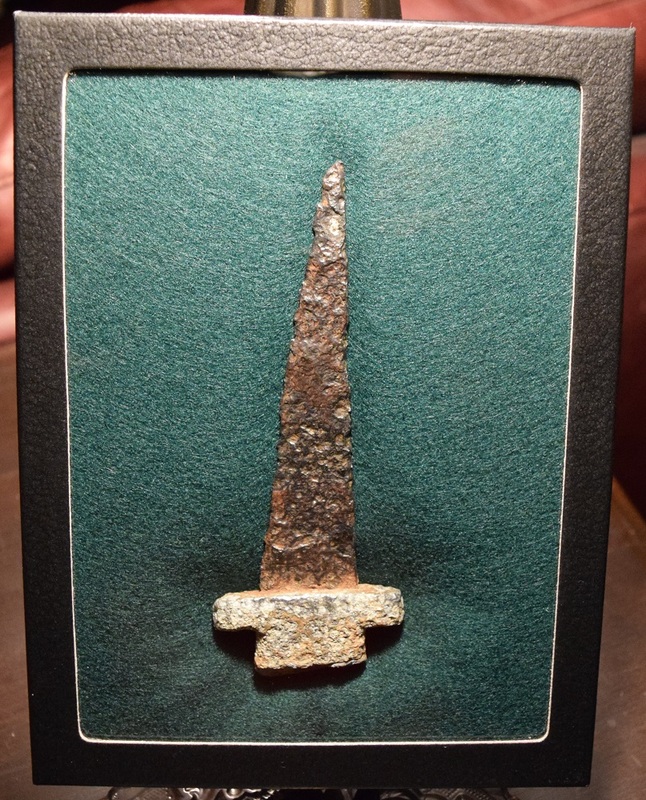 After showing it to a specialist in knives, I learned that this is a German ‘coup de grace’ knife, used for game, and could also be referred to as a ‘pig sticker.’ What’s really fascinating is that, according to the knower of knives, it dates to the 1700’s, and was entirely home forged. In those days, on a farm, nothing was wasted. 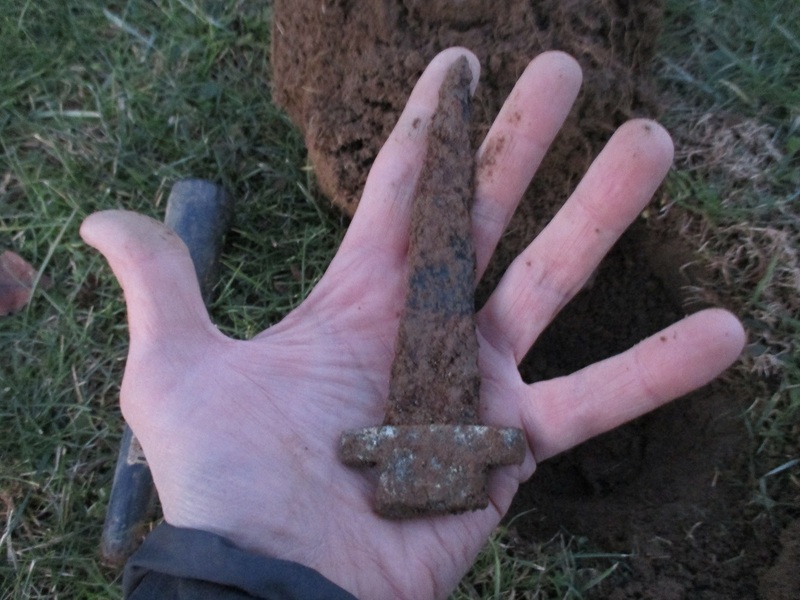 The blade was very likely made from a worn out scythe blade, with the lead hilt being sand cast. The hilt would either have been pewter or lead, whatever was available, but with the weight, there’s no doubt this one’s lead. Both materials are durable and have a low melting point. The shank, in this knife is a ‘rat tail’ type and went about a third of the handle length. 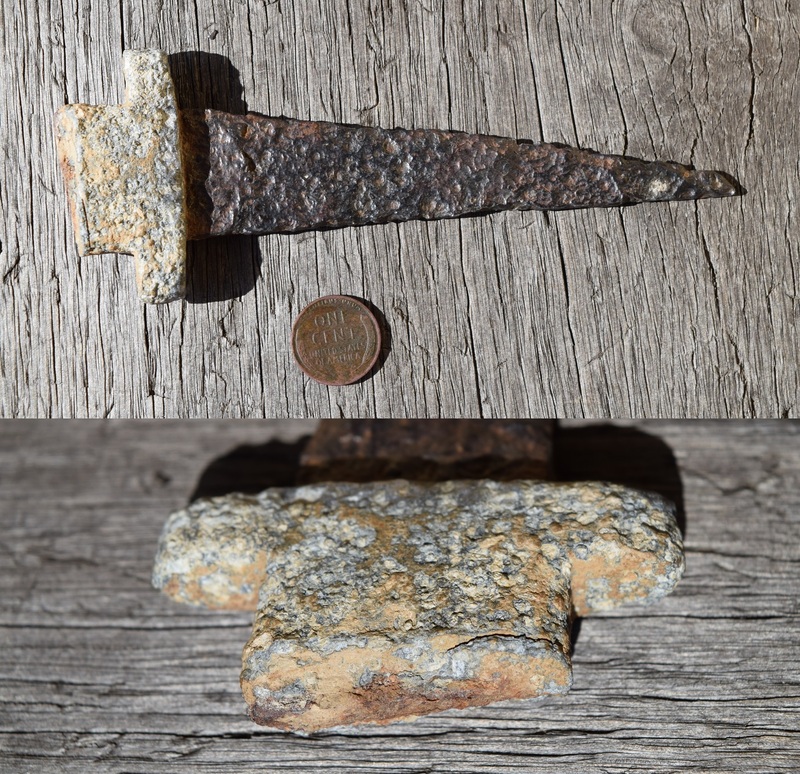 It is quite an interesting artifact, and to me, resembles something like a midieval or Viking relic, as it was made very simply, in an identical manner as one would have made a knife during the Iron Age. Of course this piece deserves to be displayed under glass, it’s the oldest artifact so far from the farmhouse. I was hoping for the Buffalo version and still may find one here, but in the meantime, this was rather nice. 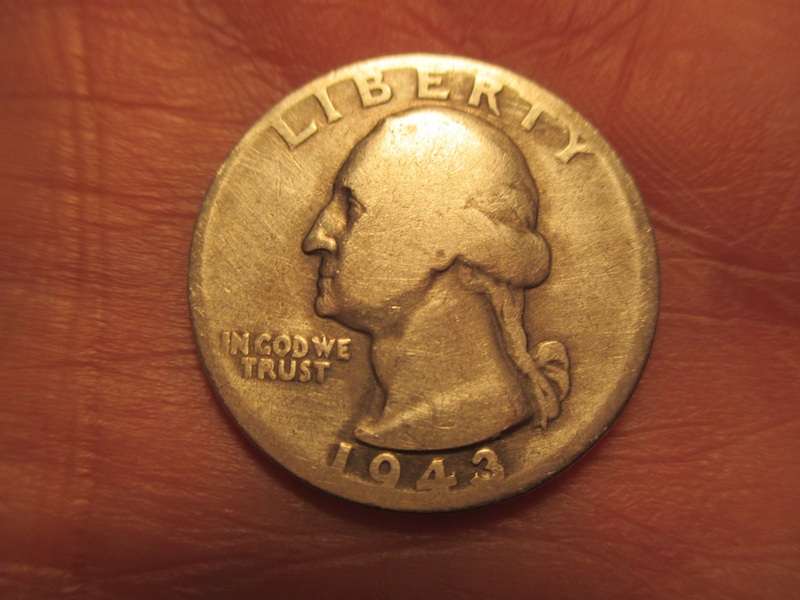 During WWII, nickels were made with thirty five percent silver. A bit dirty, maybe a very gentle and careful rub will get it to show. There we go, a nice 1944. It might as well be pure silver as it looks nothing like the dark patina clad ones. I found this lovely gem just ten feet from the porch, about five inches down. In the hole as it sat, the gemstone appeared blue at first, then in full light I could see the red. Surprisingly, my camera caught that too. I still don’t know if it’s a gemstone, or just glass, but it’s no child’s trinket. It’s marked Sterling with an arrow on either side of a M pointing at it. A quick Google learned me that this was made in Providence, Rhode Island, by Thomas McGrath. He made jewelry from 1907 until 1951 with this particular mark. It may be older than I think, but by it’s Art Deco look, I would venture to guess 1930’s. The cascading, stair-stepped heart with alternate edge beading is a very beautiful design. It has seen some wear, very much so, before it was lost. I found this on Christmas Day. 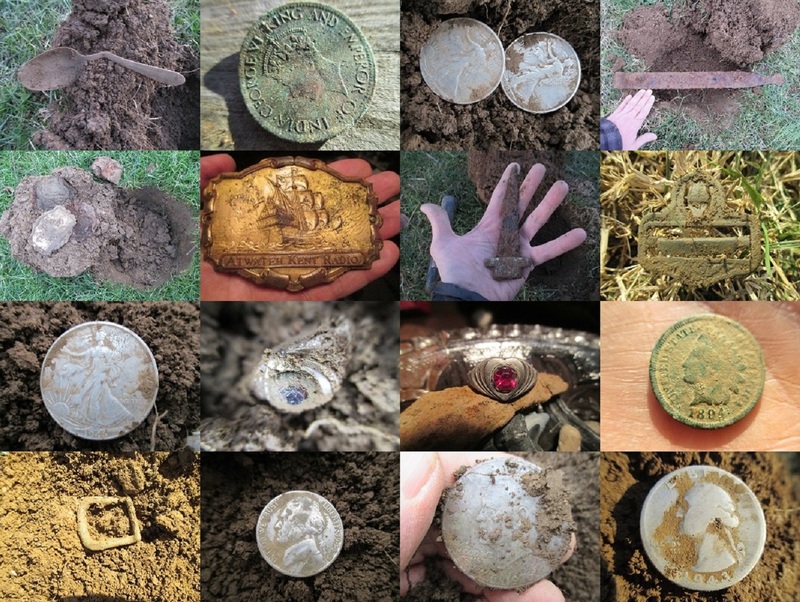 Yes, there is treasure in the ground, here’s proof. The only thing I know for sure, was the gal who wore this was not named ‘Brittany.’ Likely Elizabeth, and she was a true lady, no jeans or pants, but dresses. Beautiful. And I have walked over this for years, never knowing it was there. This picture tells quite a bit about my history as well. (I only chose this as the lighting was favorable.) The ring is sitting on the tip of the horseshoe, which rests on 20 million year old shark teeth I spent a third of my life diving for in Florida. The bowl containing the fossil teeth is an 1830’s flint glass ‘Lacy’ bowl made by Boston & Sandwich Glass Company. All of my interests are tied together here. I didn’t expect this to be what it was. I was 20 feet off the north side of the barn and got a 77 reading. I almost blew it off as a bullet casing, but the 77 remained constant, it didn’t fluctuate down to 65 a then back up as bullet casings and shotgun casing ends do. If the signal stays steady, dig. I dug. I had cut a 6 inch deep plug, popped that out and no, it wasn’t in there, it was still in the hole. Using the pin pointer, I poked it down and got a reading at direct center bottom. 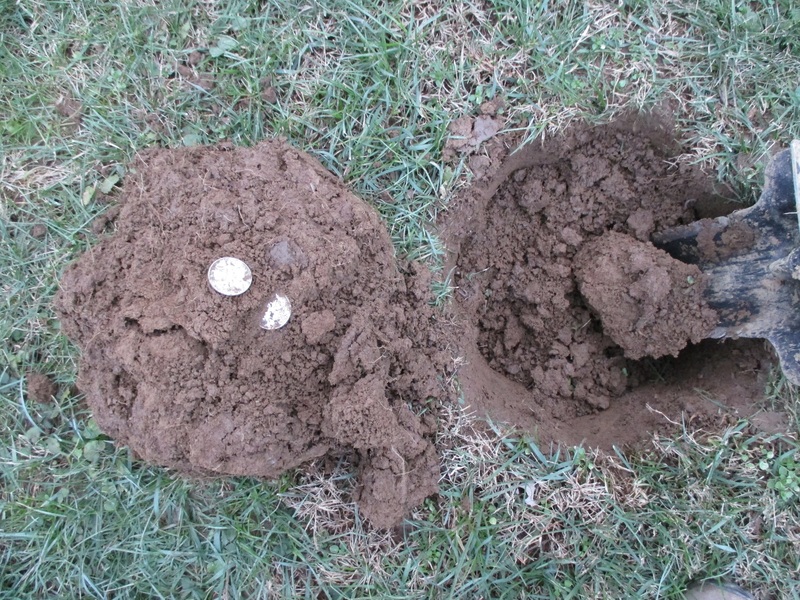 Taking my hand tool, I cut around the center and pulled a couple of handfuls of soil out and set them next to the hole. Back down with the pin pointer. No signal from the hole. That meant I had pulled the object out. 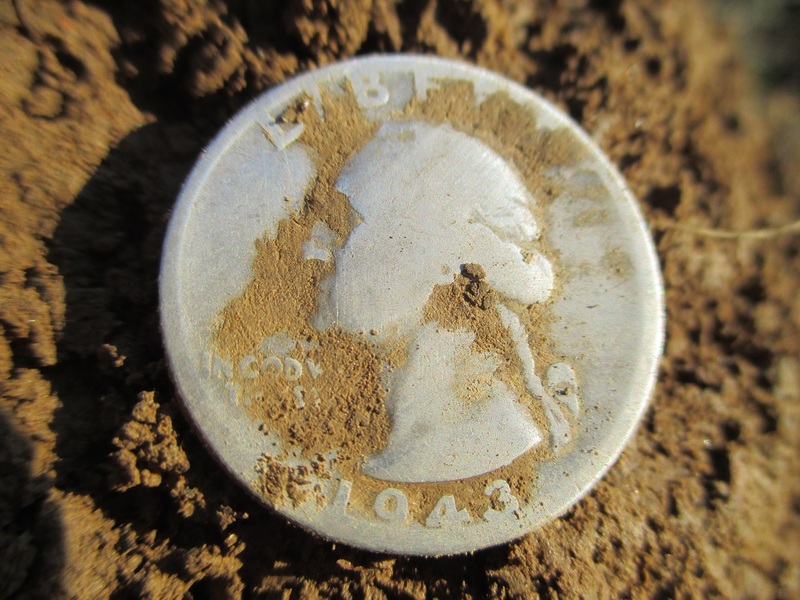 Rummaging the pointer into the pile of soil, I got the signal and there it was, a small dirt caked coin. I remember thinking this is deep, even for a wheat penny. (I had pulled it from about seven or eight inches down.) The double shot photo below is what I had in my hand. 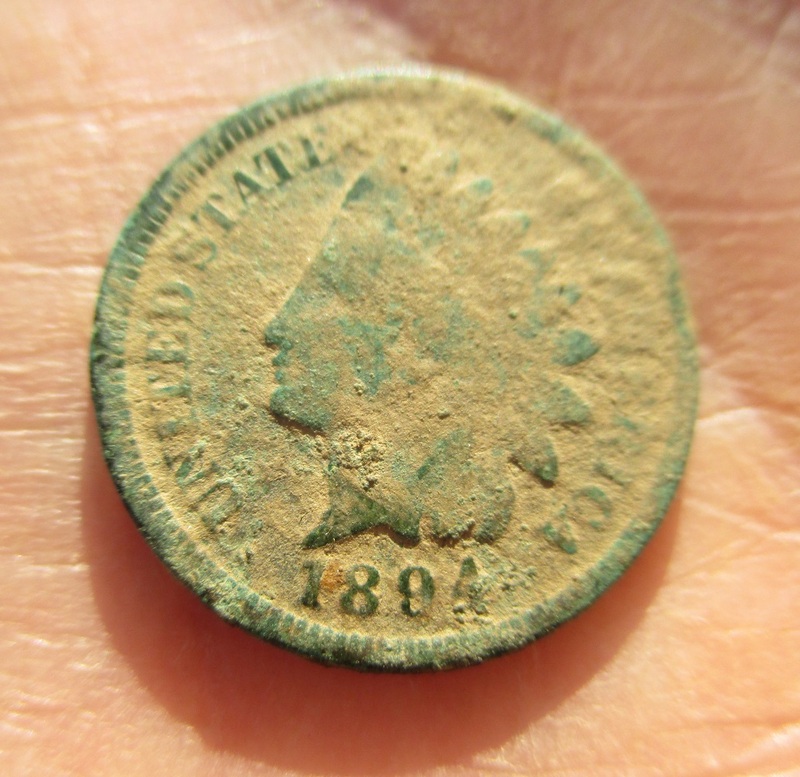 I couldn’t believe it, I was wondering when a much older coin would make an appearance. This had me excited. Well, I had to rub a little of the dirt off. 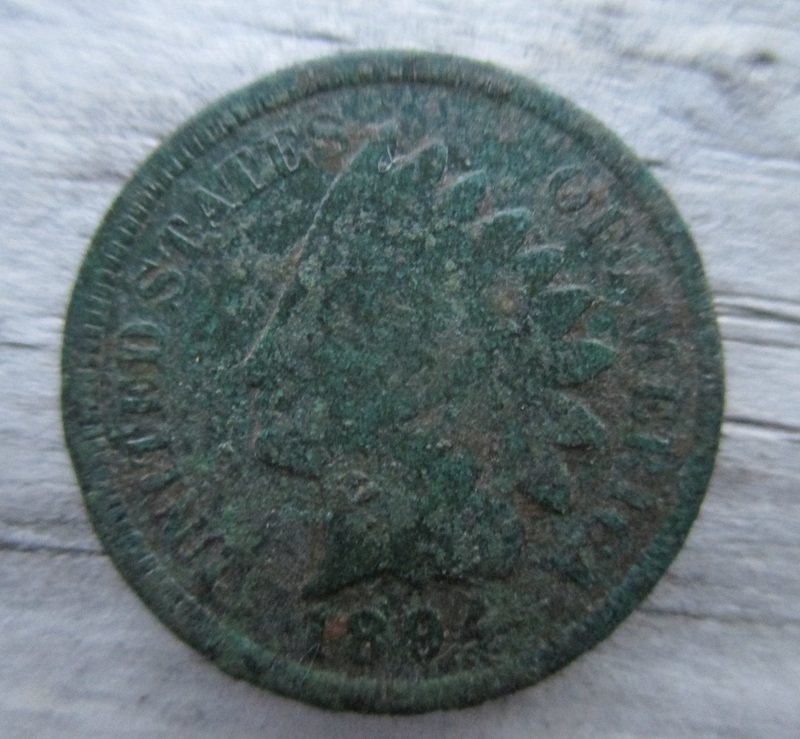 I knew it was a copper coin and I could also see it had a beautiful green patina. 1894. This was easily in the ground 100 years. This was an amazing find and I almost thought it wasn’t there. I had got the high signal, and fortunately cut a larger plug. 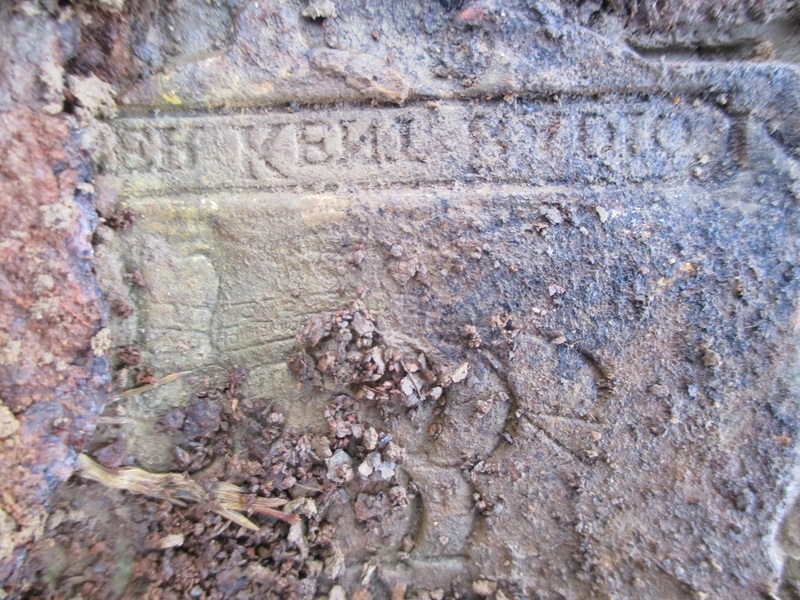 Flipping it back, I saw what appeard to be an imprint in the soil, and the word RADIO backwards. I think I’ll let the photos tell this story as I had taken out my pocket camera when I saw how interesting this was. I wasn’t sure what to make of this. 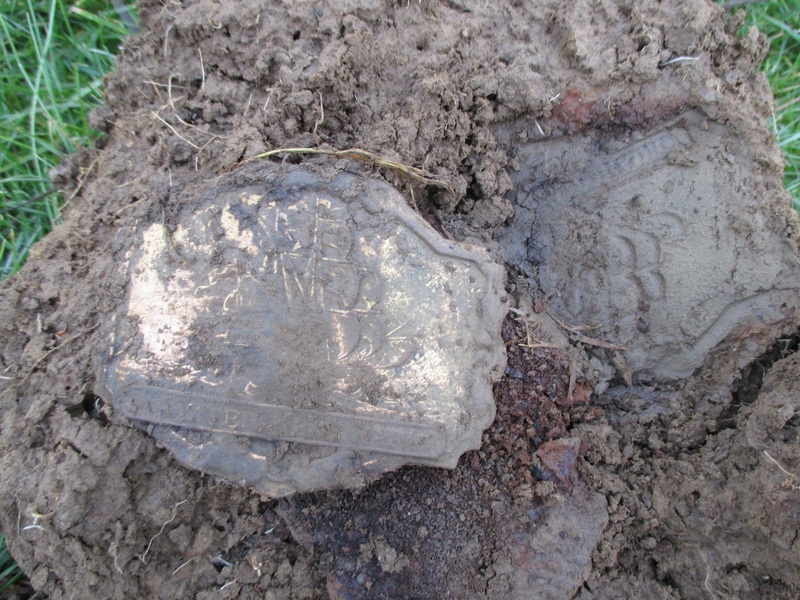 At first glance it appeared that whatever made the imprint was all rotted away on the left. A closer look would prove me wrong. Looking a bit closer, I still wasn’t sure. Finding an edge, I realized that it wasn’t an imprint after all and flipped it over. What could this be from at least five inches down. 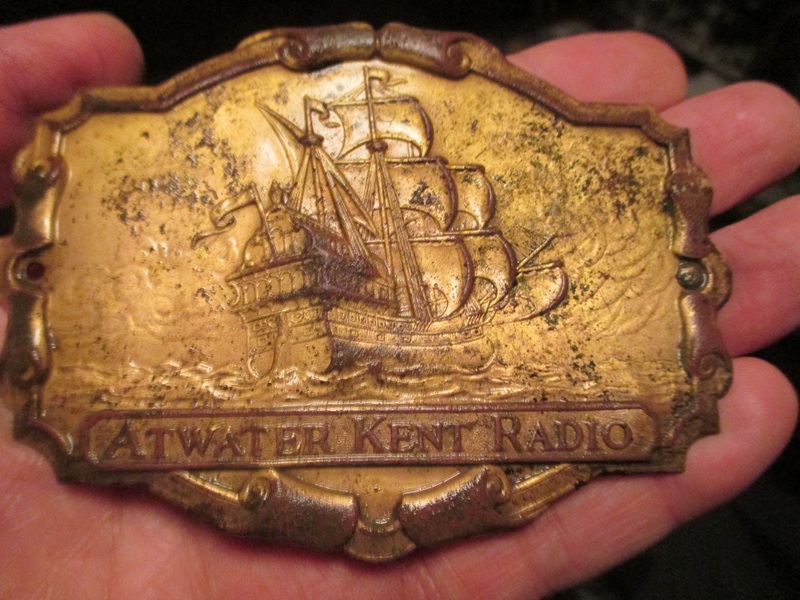 What exactly does ‘Atwater Kent Radio’ mean? After a gentle cleaning and rinse, I had something very cool and very beautiful in my hand. This is what’s it’s all about for me, something new to learn from right out of the ground in my yard. 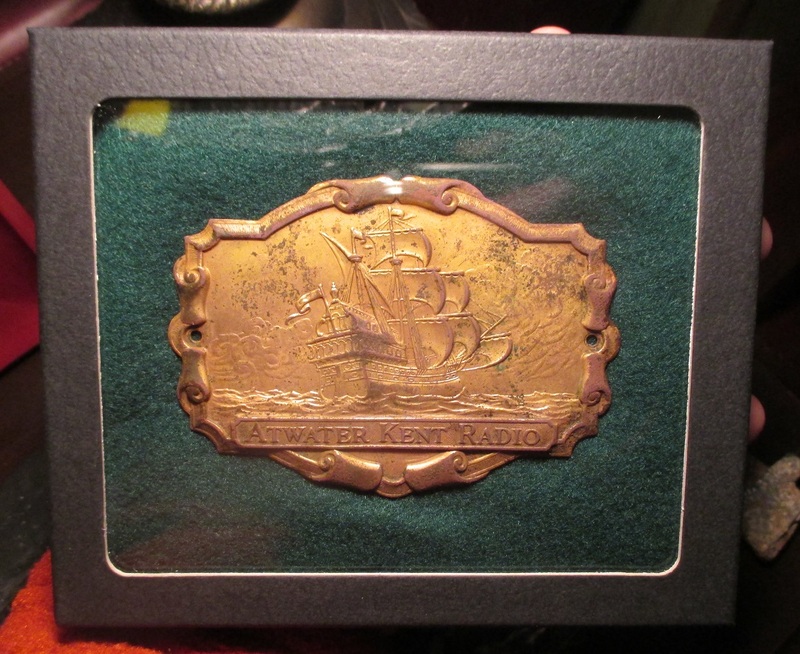 Atwater Kent made some of the most beautiful early radios. His 32 acre plant was located in Northwest Philadelphia, on Wissahickon Avenue. 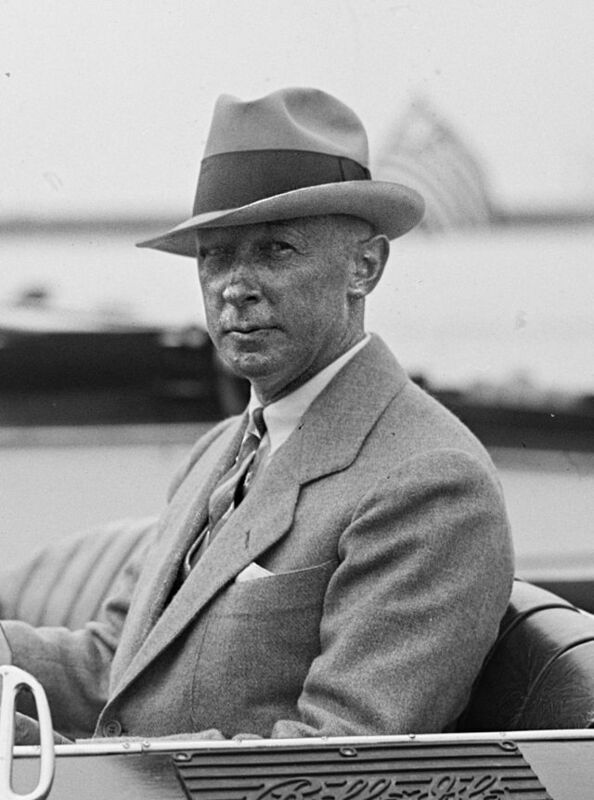 By 1925, he was the largest radio manufacturer in America. My roots are in Northwest Philadelphia, and my Grandmother used to take me to play in Wissahickon Creek when I was a toddler. Atwater Kent was in business making state of the art radios from 1921 until 1936, when, disgruntled at the mass production of cheaper models, he sold his plant to Philco and simply walked away from the competition. In 1937, he both paid for and organized the restoration of the Betsy Ross house. That not being enough, he then bought and donated the Franklin Institute to the City of Philadelphia. (I went on a school field trip there as a youngster, then my own trip there as a young adult.) Born in 1873, he ended up retiring to California, where he died in 1949. My backyard dug gold plated radio medallion is bigger than a belt buckle and was featured on many of his 1920’s radios, both battery operated tabletop and cabinet models. 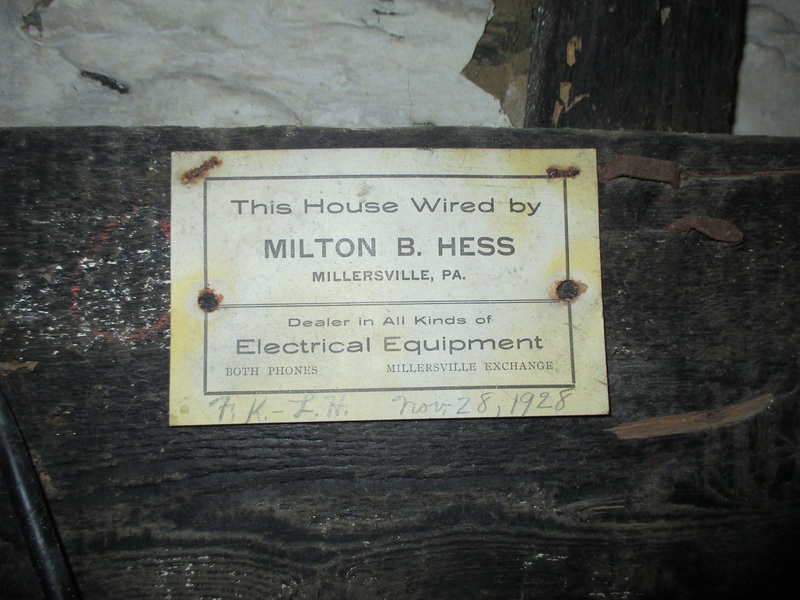 All of this makes sense as the farmhouse I live in wasn’t wired for electricity until November 28th, 1928. How do I know this? The original installation card just above the basement fuse box. This is one of my favorite backyard artifacts and certainly deserves to be under glass. My favorite find sitting on top of the replaced plug after it was unearthed. All that history came from right under this spot. Amazing. I wonder if the girl who had the ring listened to that Atwater Kent radio. It was a cold, but very sunny day. I was sweeping an area under an existing tree not far at all from where I found the Walking Liberties. I had run through this area before, but this time I was focusing on the tree and doing a circular sweep, working my way outward. Getting a 92 signal told me there was a spot I had overlooked until now. In the exposed plug, another ‘something shiny’ was exposed. Yes, more silver. This silver quarter was so well used, it is almost as thin as a dime. The edges are not only worn flat, they’re well past that and angled. How many hands did this pass through, only to end it’s journey in mine? The extreme wear gives it character. This was indeed a very nice find to end the year. 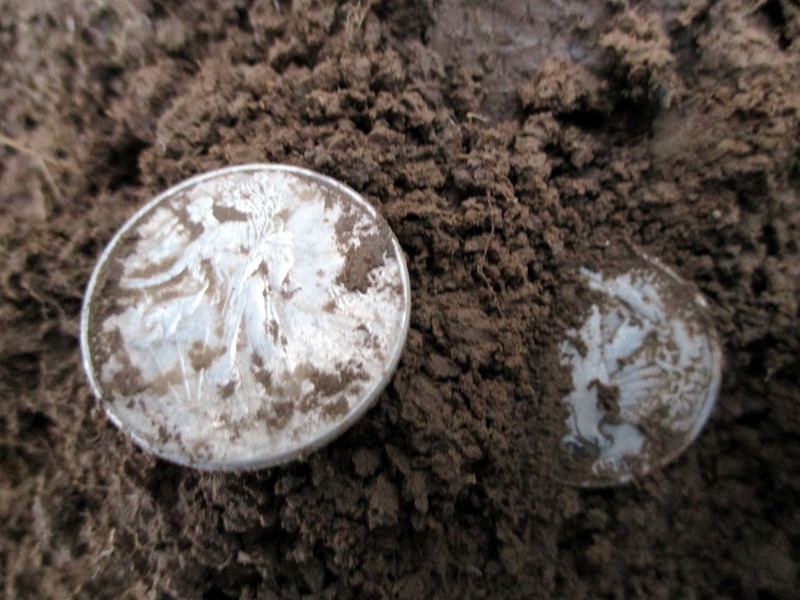 A total of three silver coins found thus far in my backyard. Makes you wonder what’s in yours, doesn’t it? It’s February now, and the weather has put a damper on my detecting progress here at the farmhouse. The ground went from rainy mush to completely frozen. Yet after a mere time span of 28 days in December, I really think I’m getting the swing of this thing. The forecast for the future?